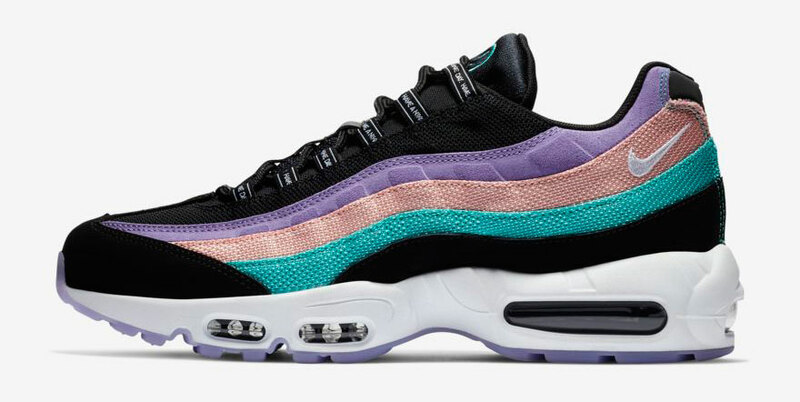 With today marking the annual Nike Air Max Day, here’s a recap of all the best new Nike Air Max sneakers, clothing, caps and other gear to match. 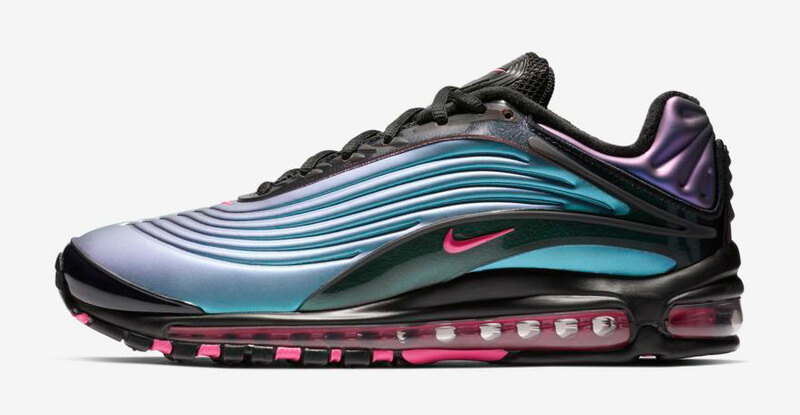 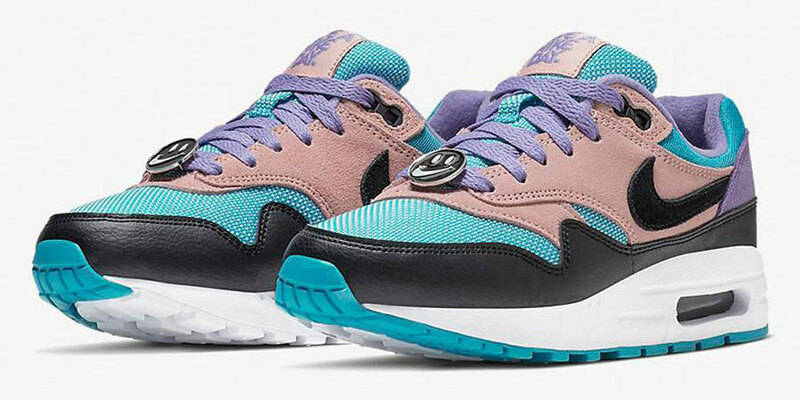 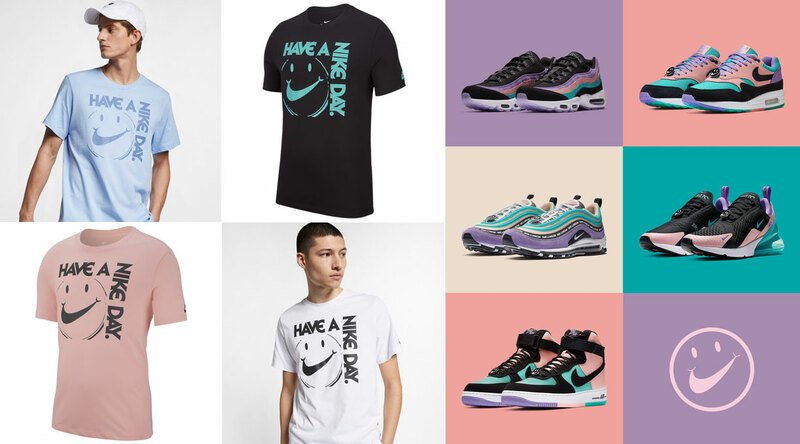 Included in the roundup below are the latest releases from the Have A Nike Day Collection, Air Max Day Culture Collection and Nike Sportswear’s Throwback Future Collection. 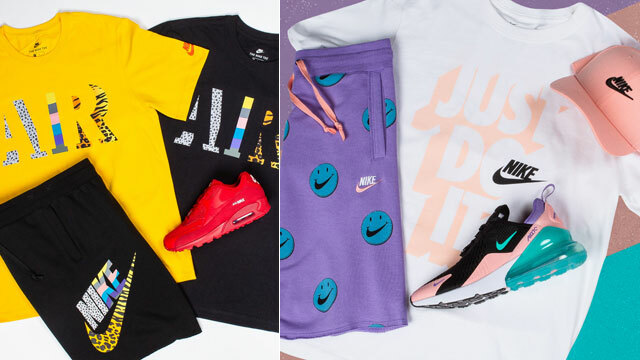 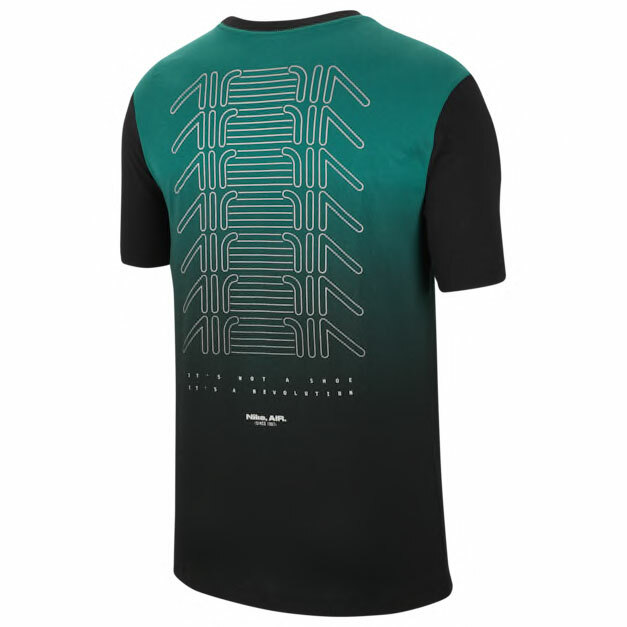 Retro running classics like the Air Max 1, Air Max 95, Air Max 97 and Air Max Plus are included, as well as modern day icons like the Air Max 720, Air Max 270 and Nike Air VaporMax 2019 models, plus all of the matching apparel hook-ups from Nike Sportswear like tees, jackets, shorts, hats, hoodies and other gear to complete the look. 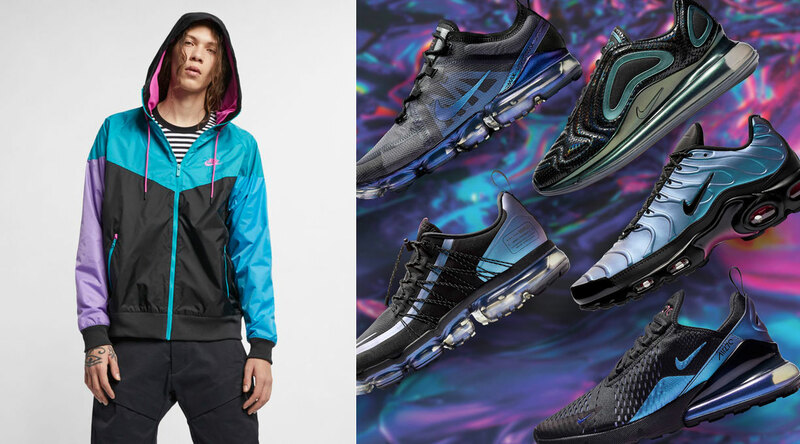 Check out all of the new gear below with more new Air Max sneakers available to buy here. 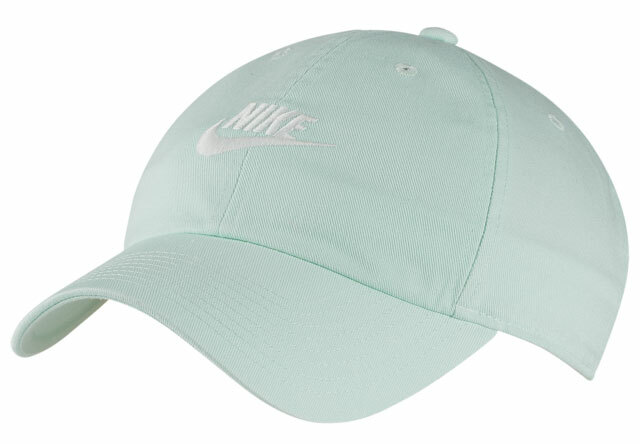 Hot on the heels of Air Max Day comes a couple new pastel colors in the Nike H86 Futura Washed Cap to match the “Have A Nike Day” Collection. 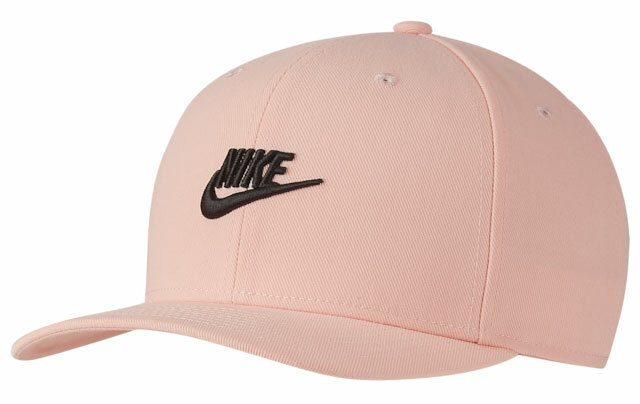 Available alongside these Nike Futura Snapback Caps and other hats to match the sneakers, these dad style Nike caps featured a soft washed design for a retro look and feel, with an adjustable strapback closure. 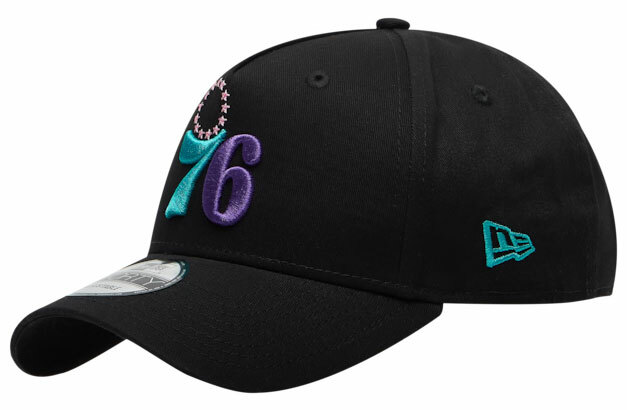 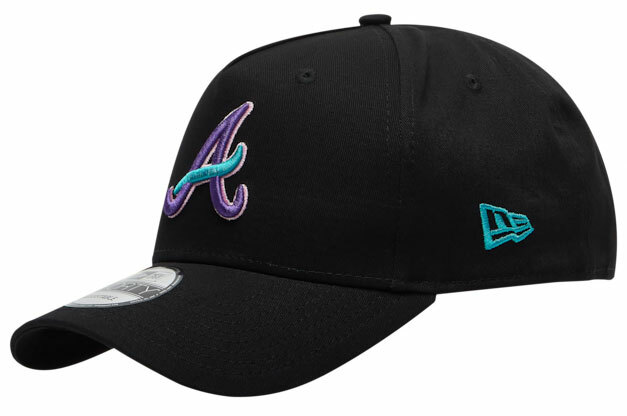 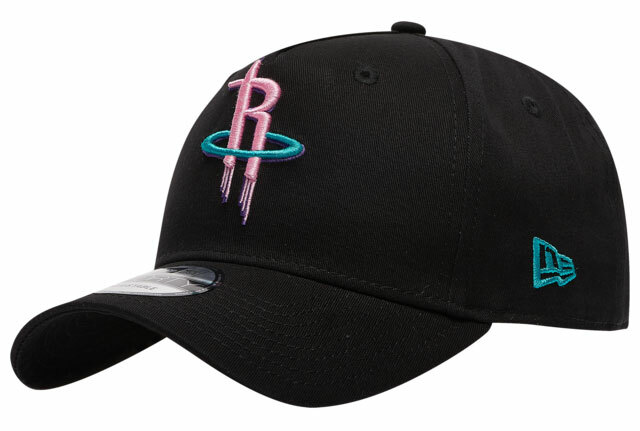 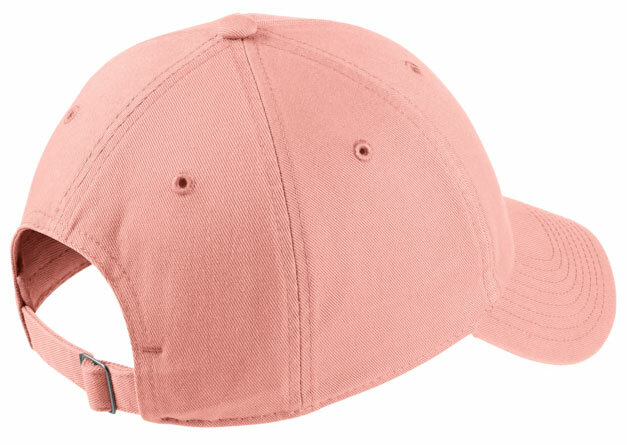 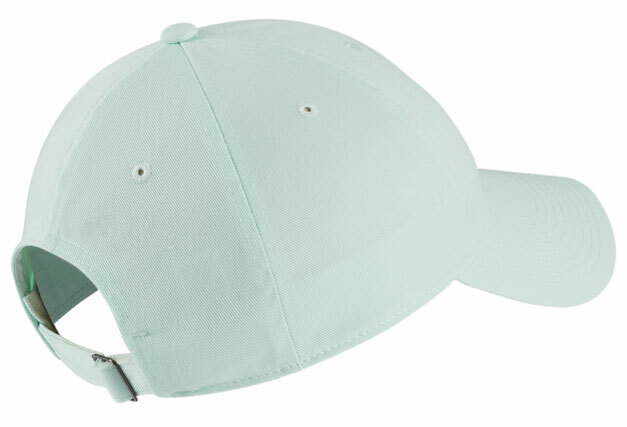 Check out the hat in pink and mint with links to cop the caps and kicks below. 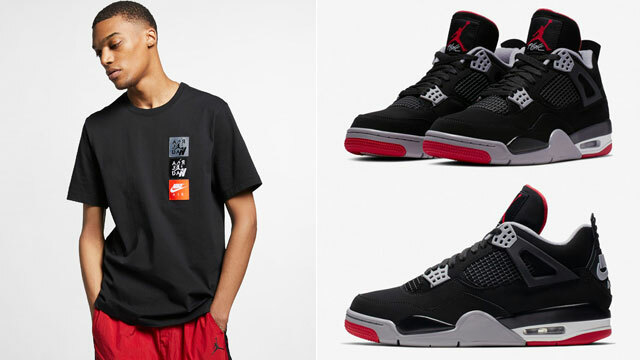 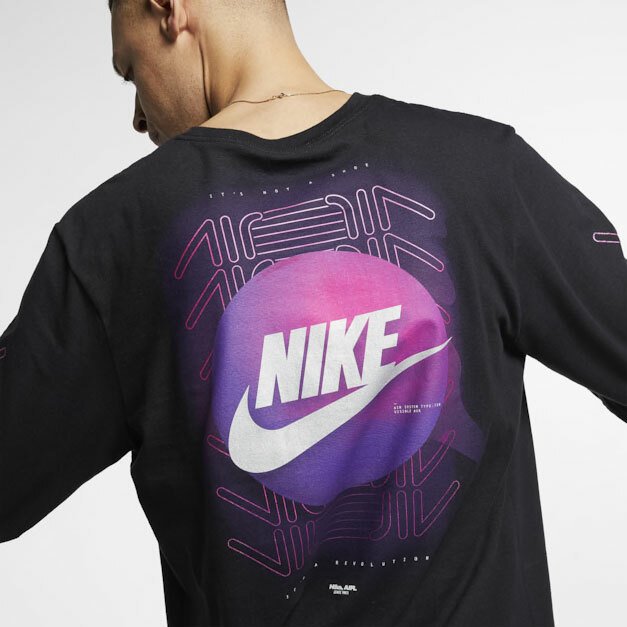 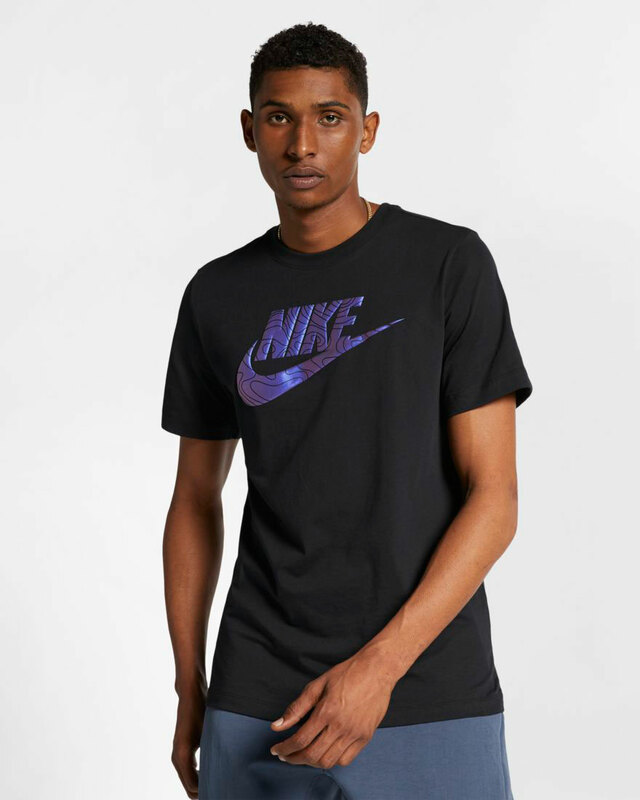 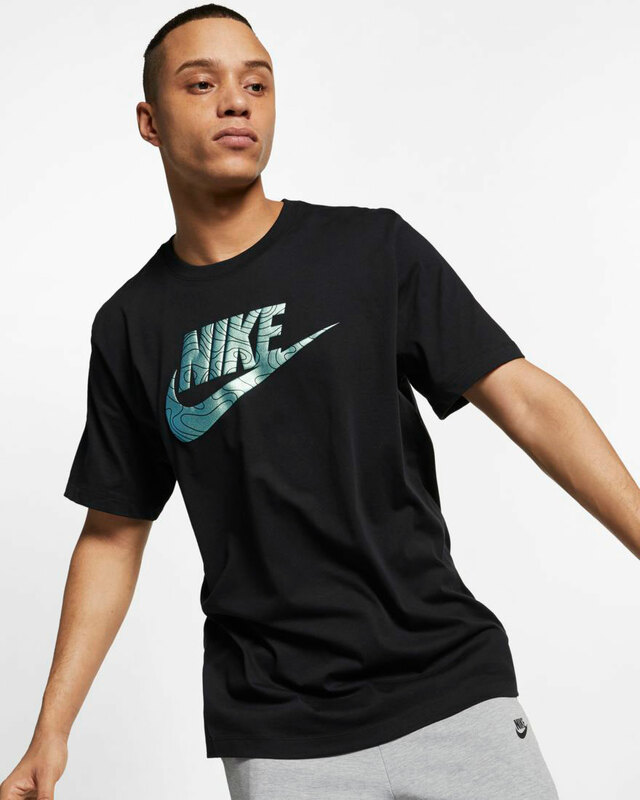 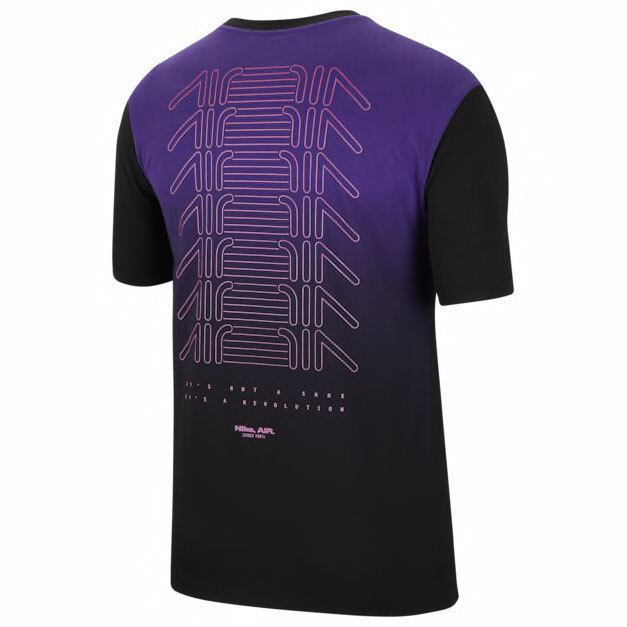 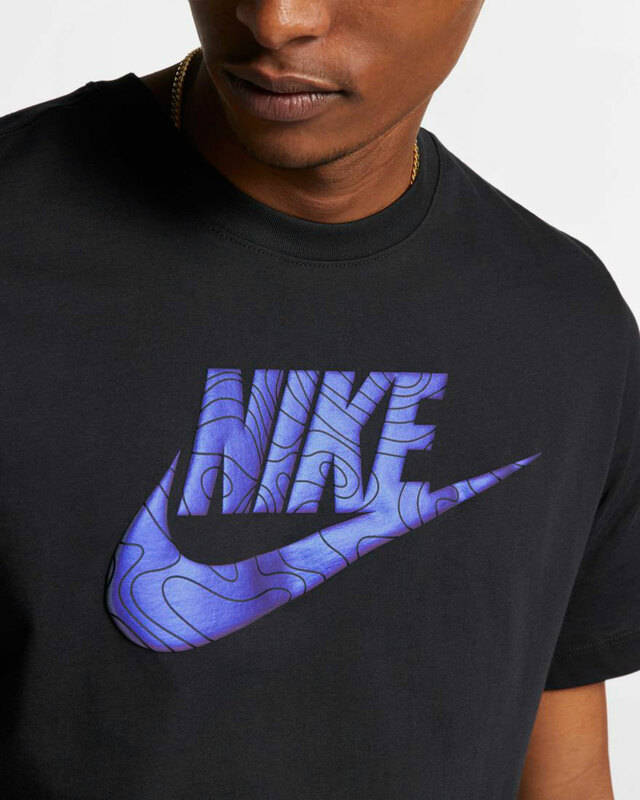 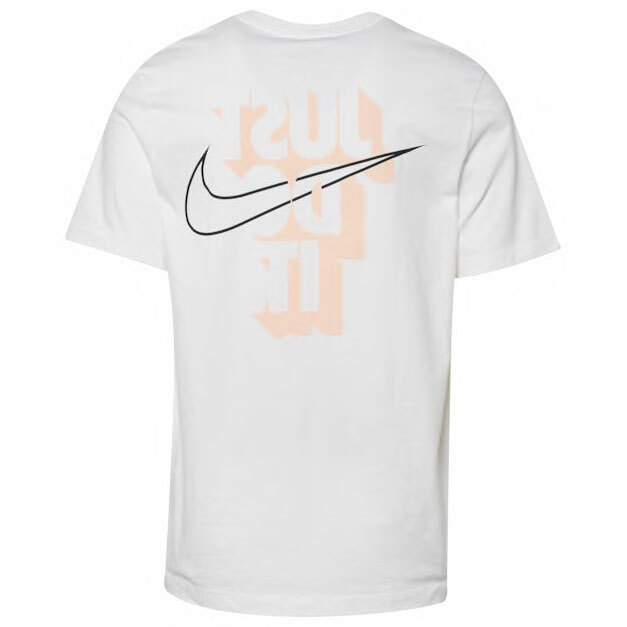 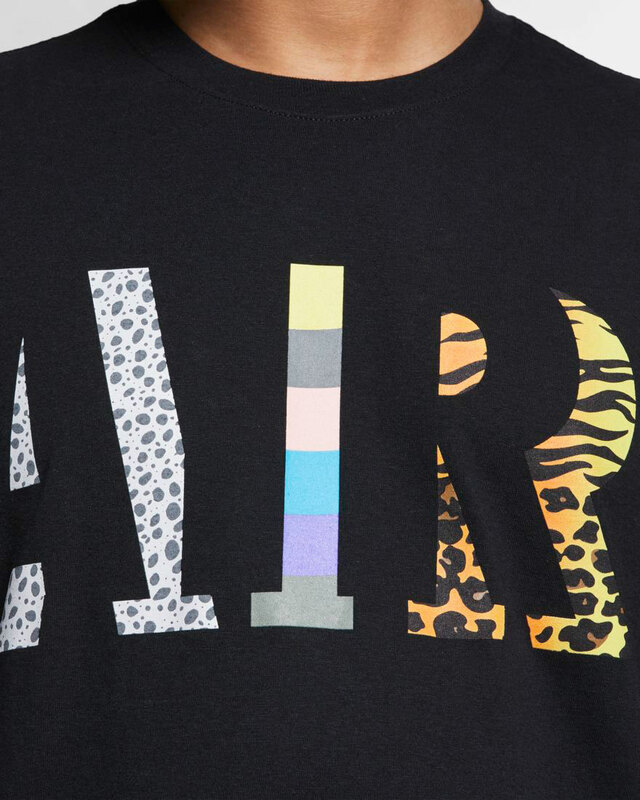 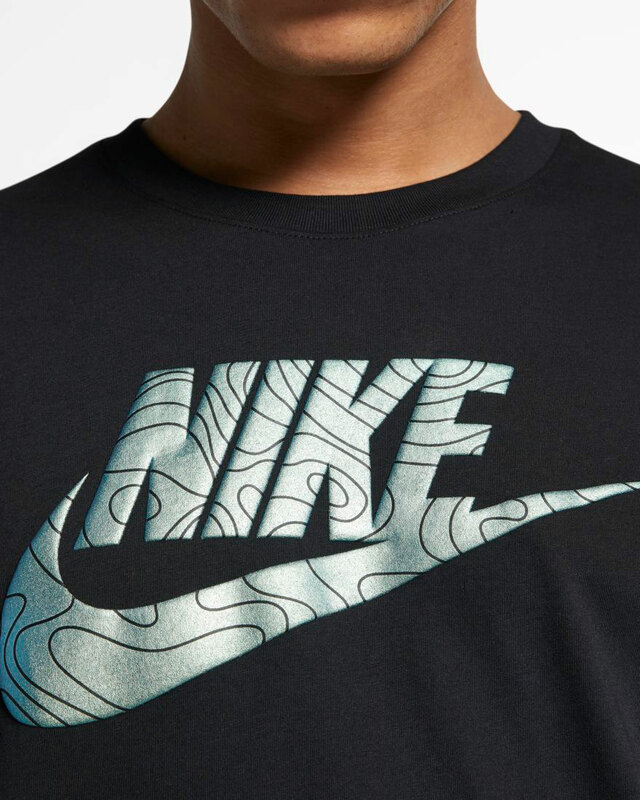 Nike Sportswear has some shiny new logo tees available in time to match the Nike Air “Throwback Future” Sneaker Pack. 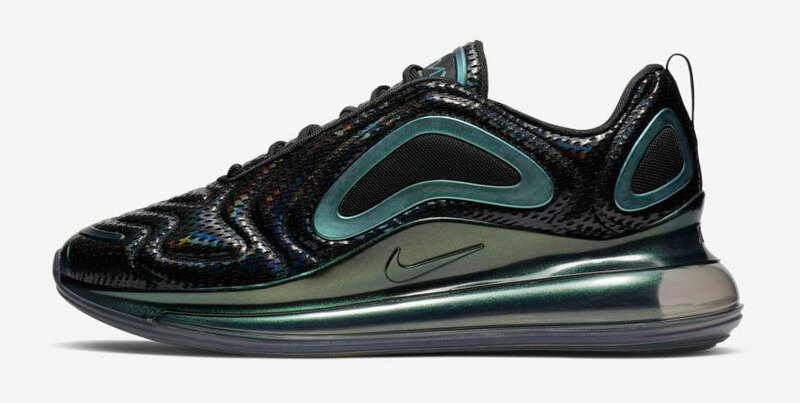 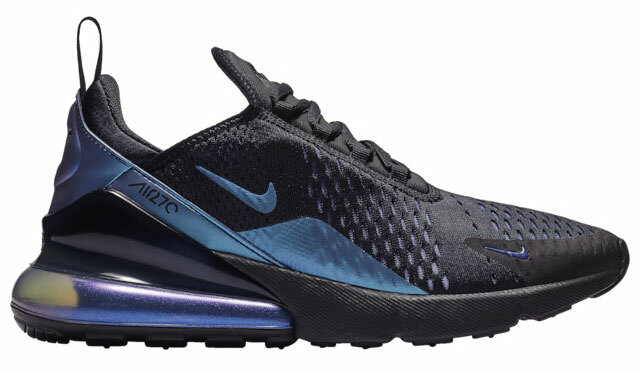 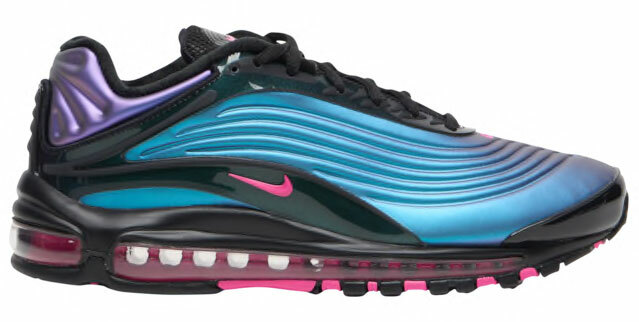 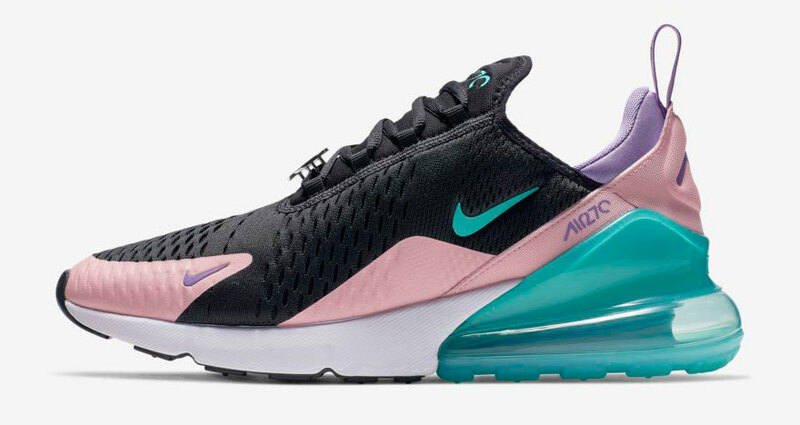 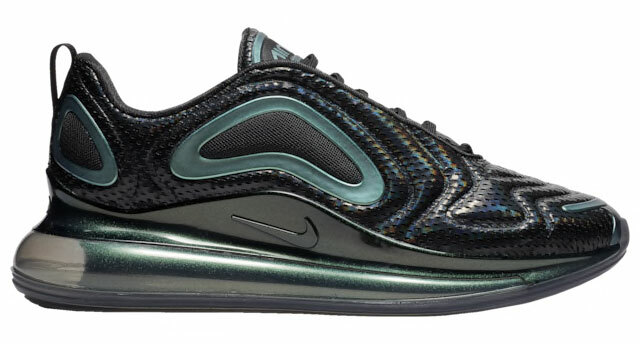 Available in two different styles to match the iridescent tints on the kicks, included below is a Black with Mint color combo to complement the Air Max 720 nicely, as well as a Black/Sapphire color scheme to hook with the rest of the Throwback Future footwear collection with includes the Air Max 270, Air Max 95, Air Max Deluxe and Nike Air VaporMax silhouettes. 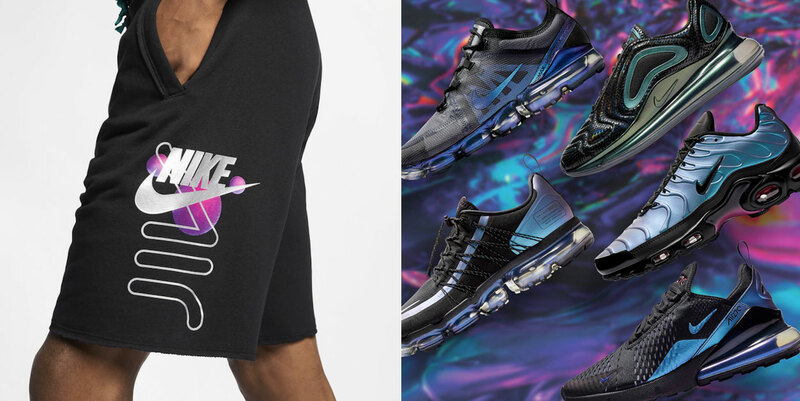 Check out the shirts and shoes with links to shop below. 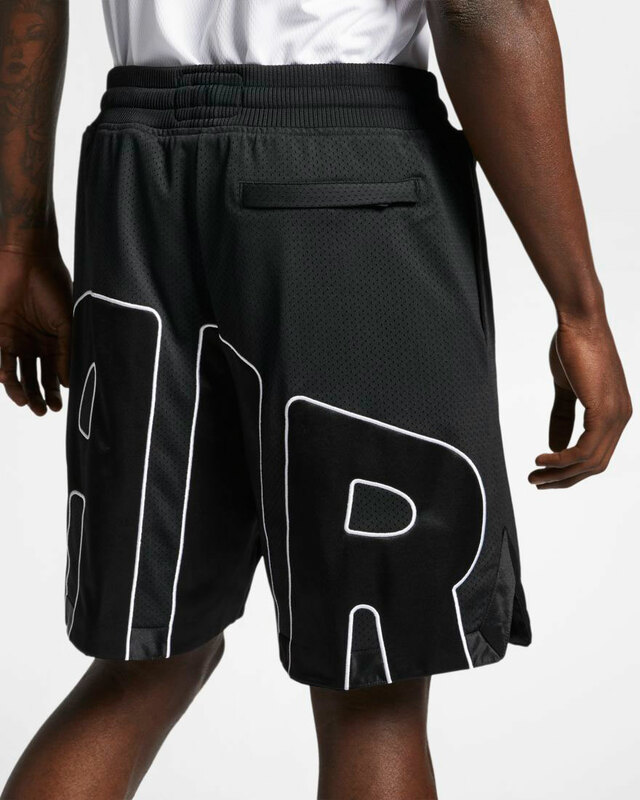 Going big and bold for Air Max Day, Nike Basketball is bringing back ’90s basketball vibes for spring and summertime hoops with these Nike Air More Uptempo Shorts. 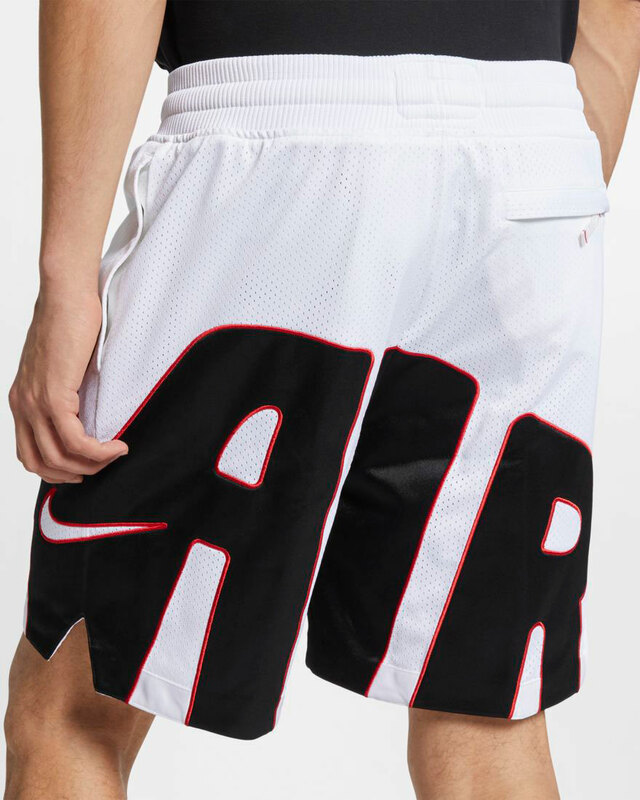 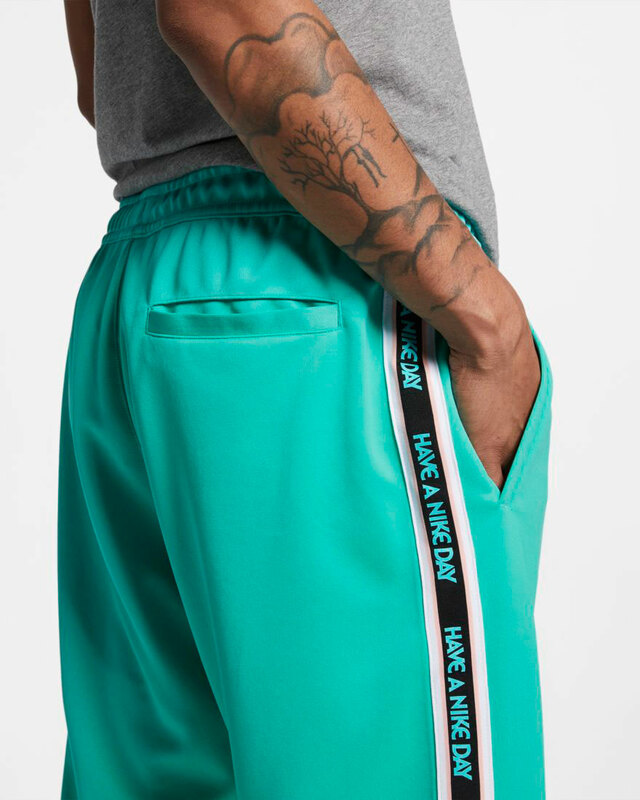 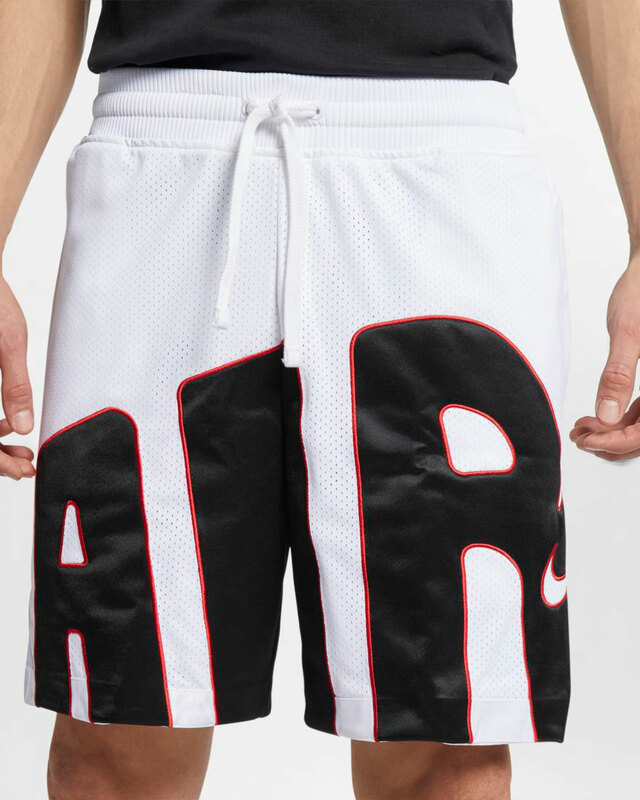 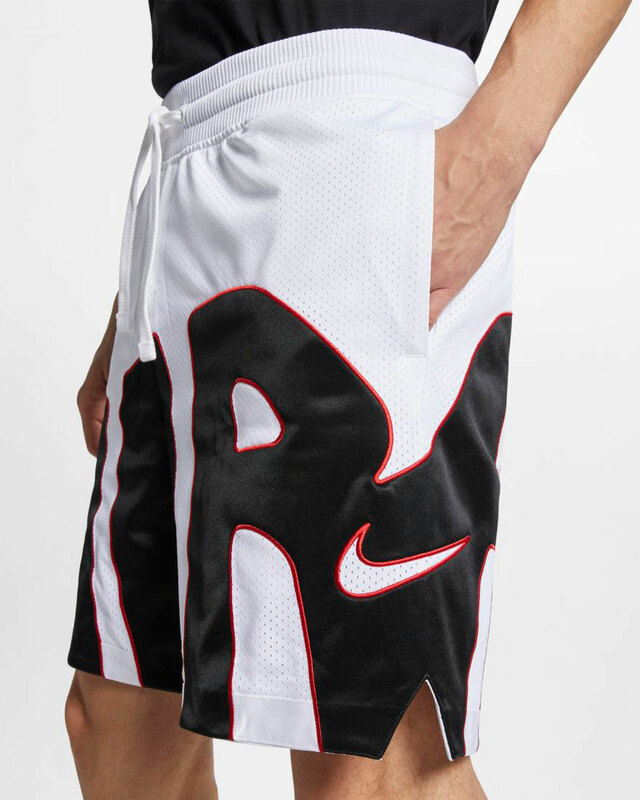 Inspired by the Nike Air More Uptempo retro sneakers, these Nike DNA Basketball Shorts give a nod to the oversized “AIR” branding that covers the sides of the shoes, with a double-layer heavyweight, open-hole mesh design and glossy cut and sewn graphics for a signature sneaker look. 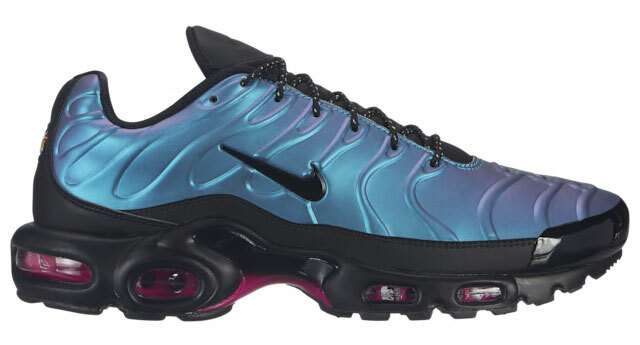 All about Uptempos? 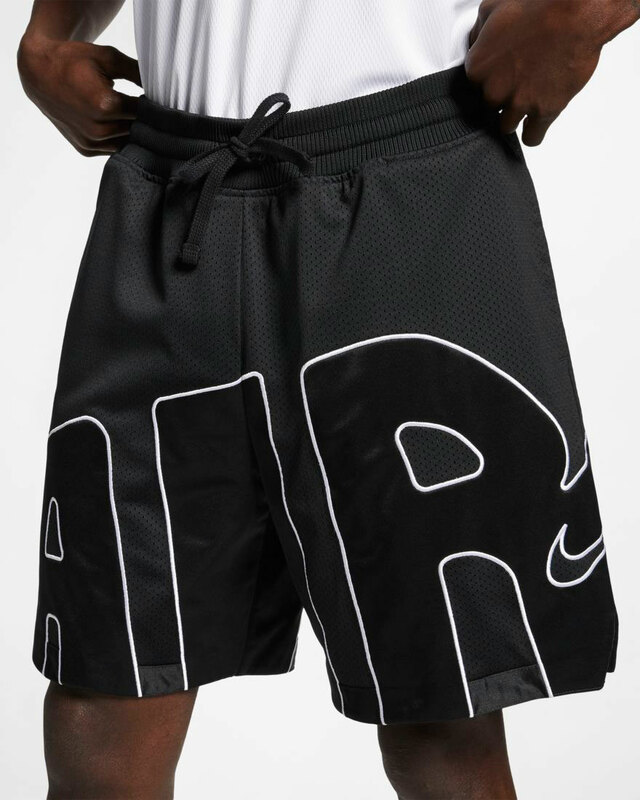 You can cop these shorts in black and white below. 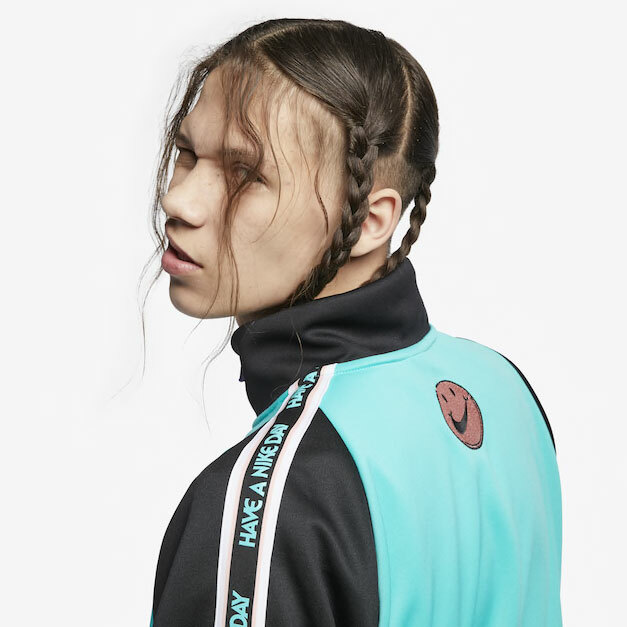 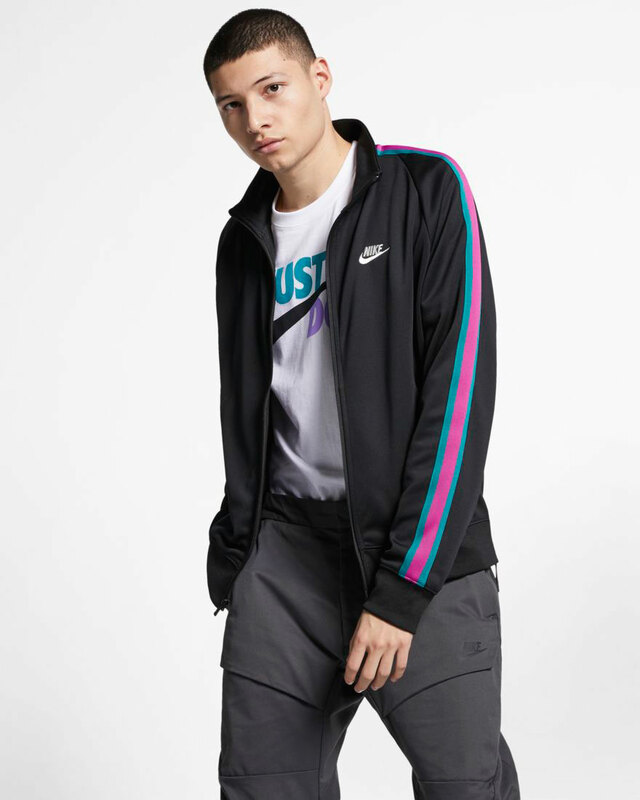 Matching up with the Nike Sportswear “Throwback Future” Collection are these Nike N98 Tribute Track Jacket and Pants to pair up with the kicks and clothing. 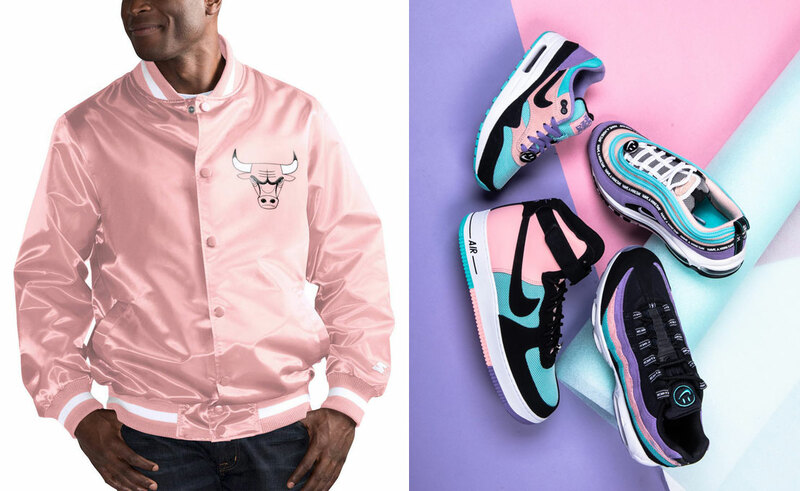 Mixing retro sport style with pink and blue accent colors to match the highlights on the shoes, both the Nike N98 Tribute Jacket and Pants offer a throwback look to hook with striped tape running down the sides for contrast effect. 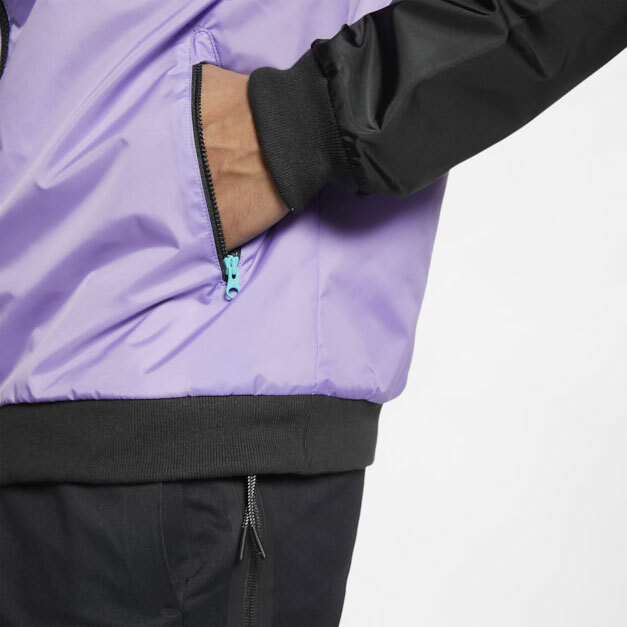 You can shop the jacket, pants and shoes below. 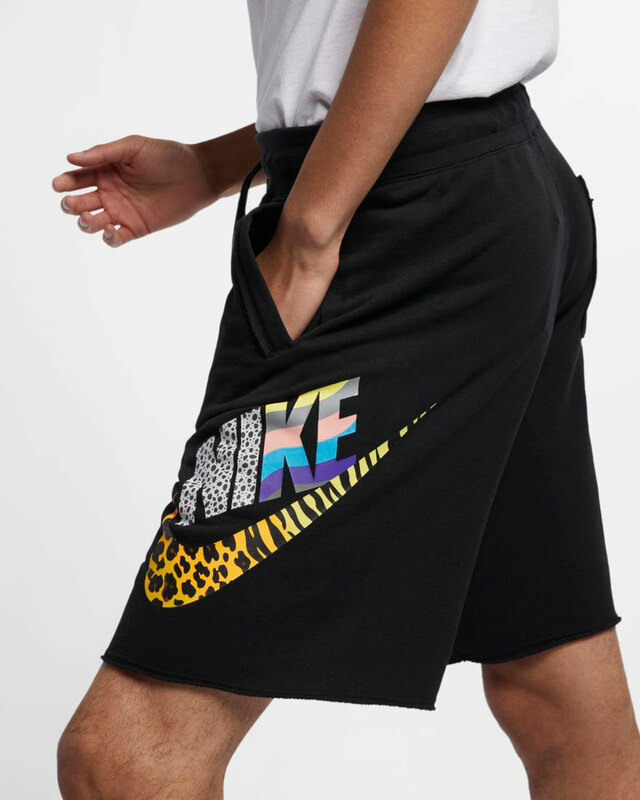 New from Nike Sportswear’s “Throwback Future” Collection are these Nike Throwback Future Alumni Shorts to sport with the pack’s retro and modern style running shoes. 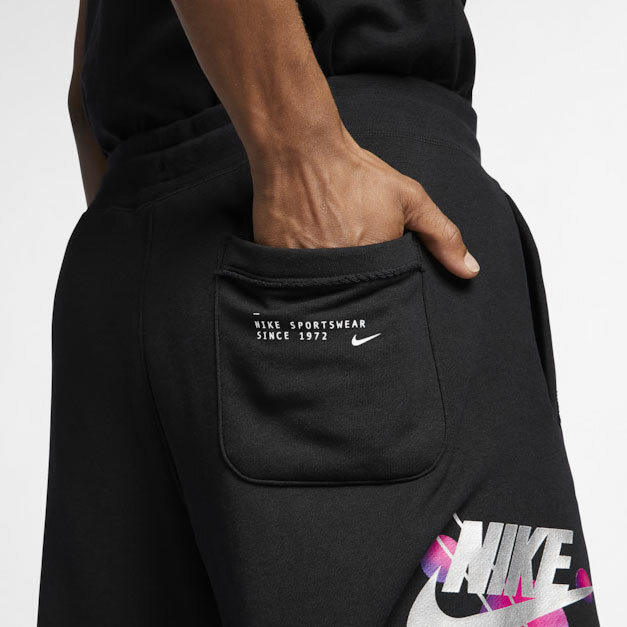 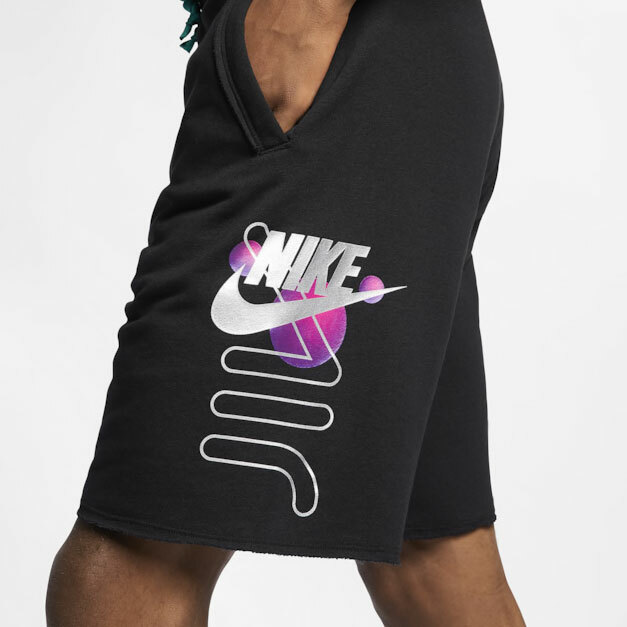 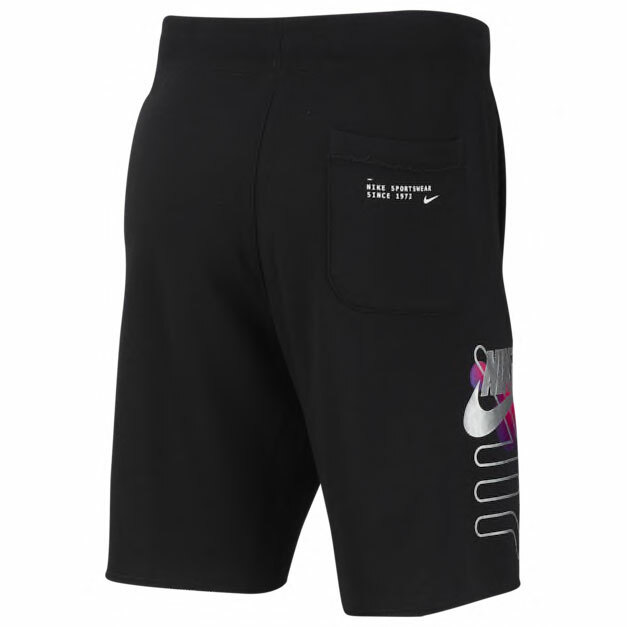 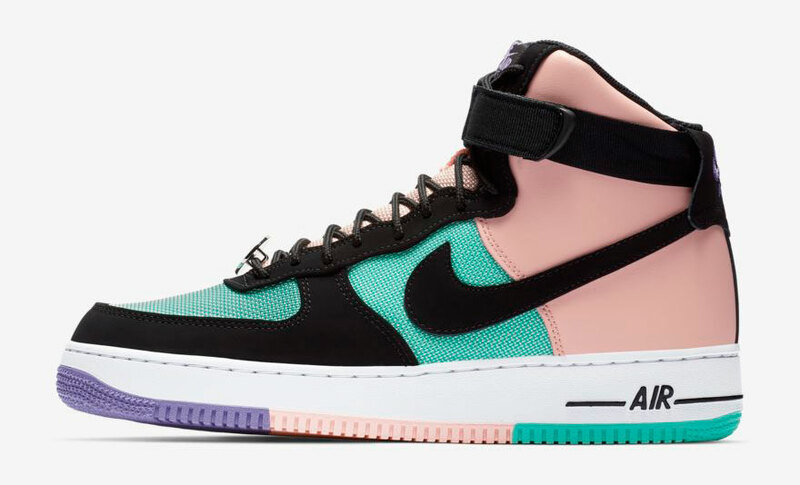 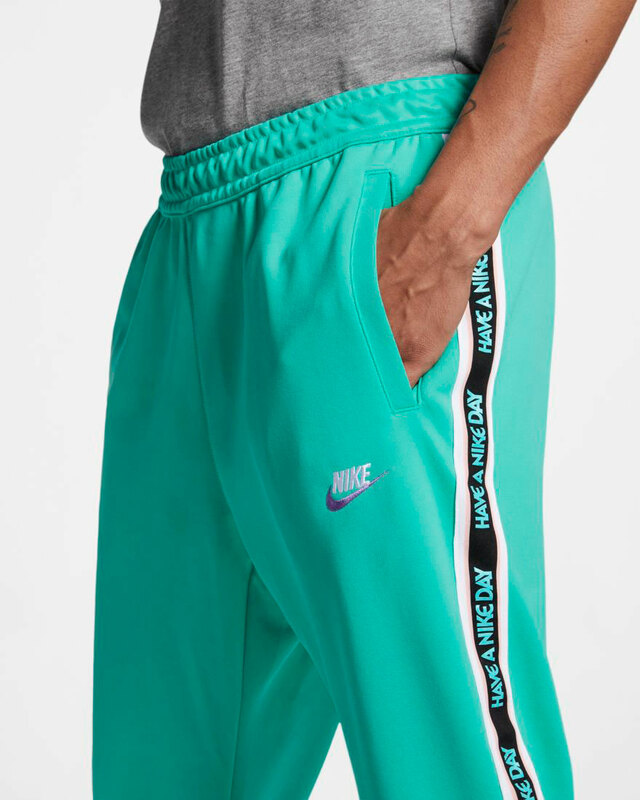 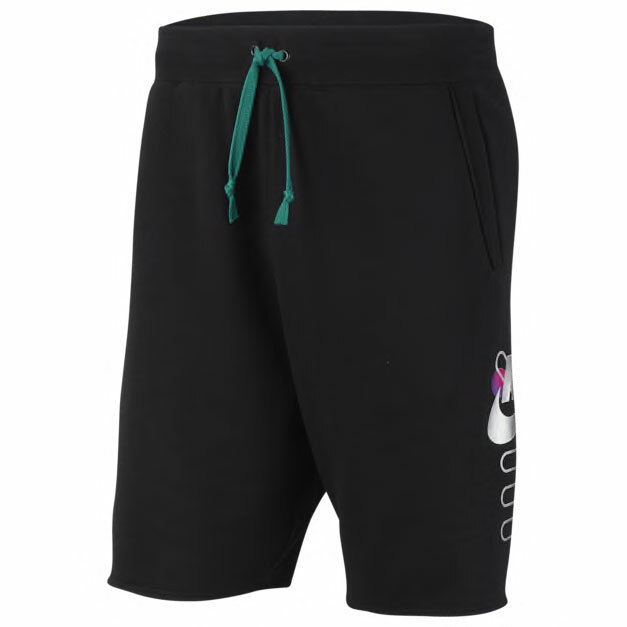 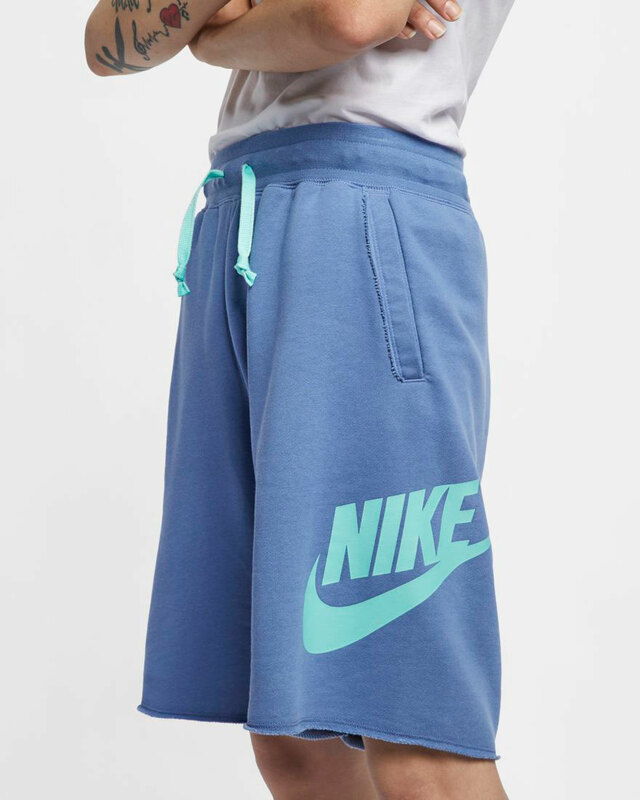 Inspired by the kicks with colors and graphics to match, these black fleece Alumni Shorts from Nike Sportswear’s Spring 2019 Collection mix in pink, purple and silver graphics to match the iridescent shine on the shoes, with a dark green drawstring, plus side and back pockets for storage. 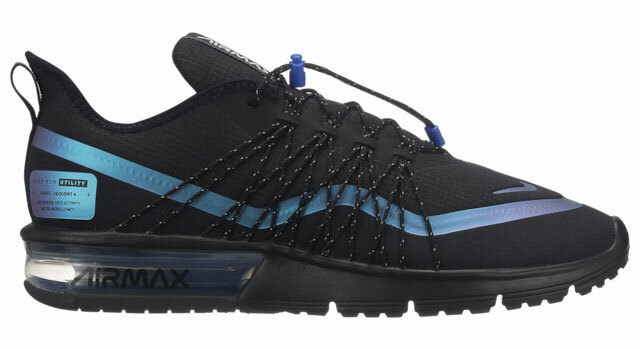 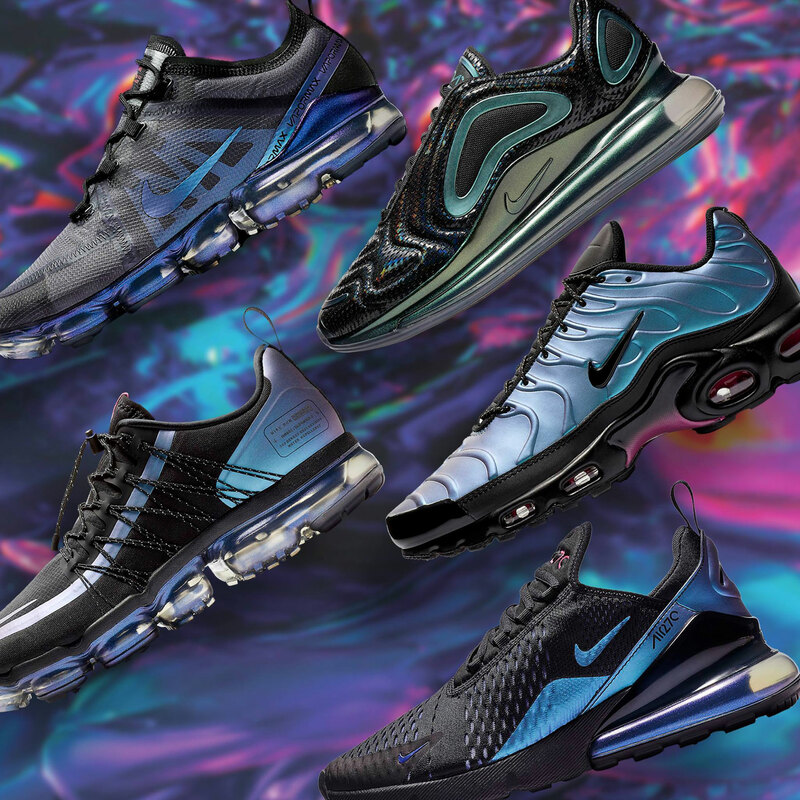 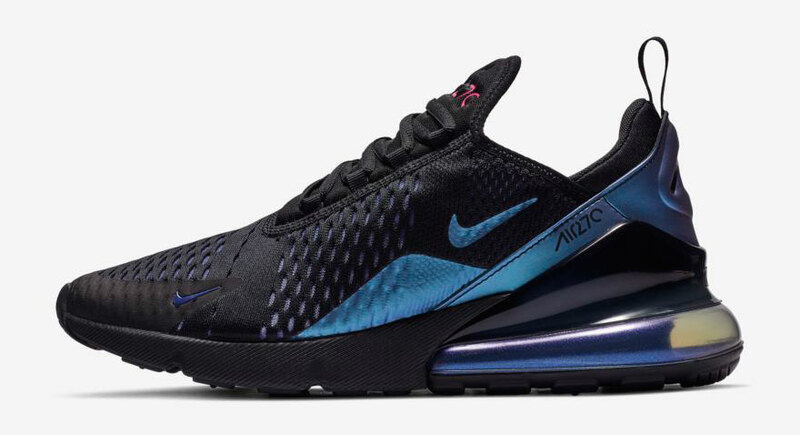 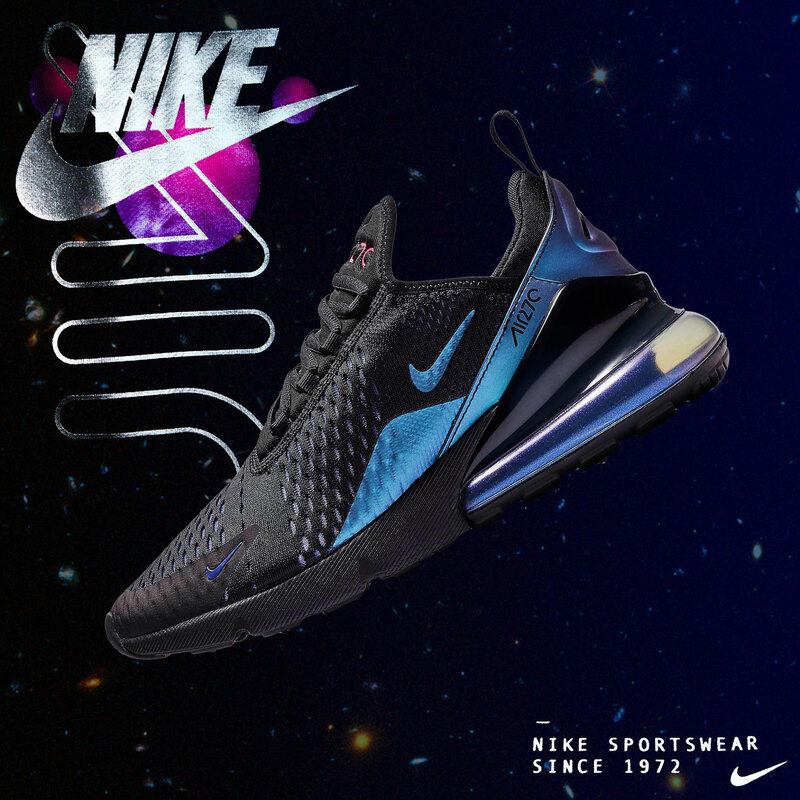 Check out the Nike shorts, along with the the Air Max 720, Air Max 270, Air Max Plus, Air Max Sequent 4 Utility and Air Max Deluxe sneakers, with links to shop below. 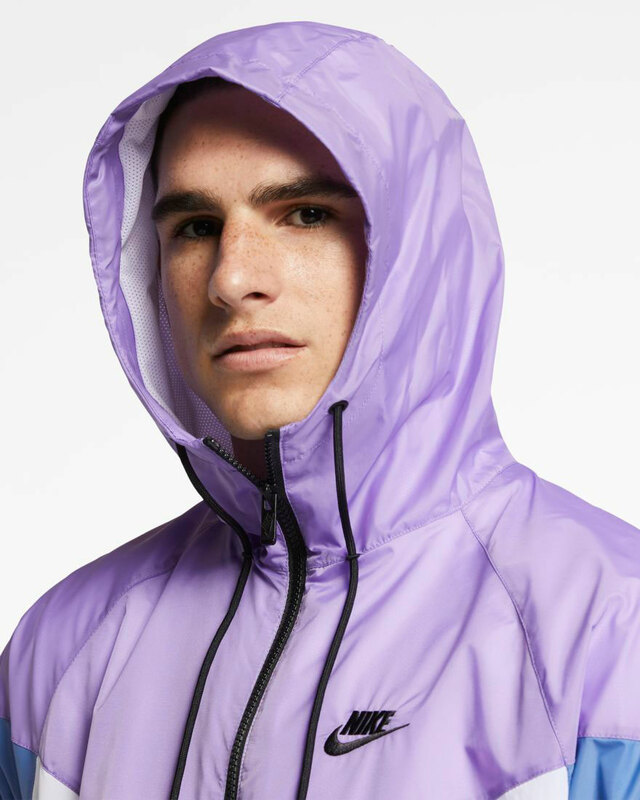 Zip up for spring in matching colors when lacing up the Nike Air “Throwback Future” sneaker collection with this new Hooded Windrunner Jacket from Nike Sportswear. 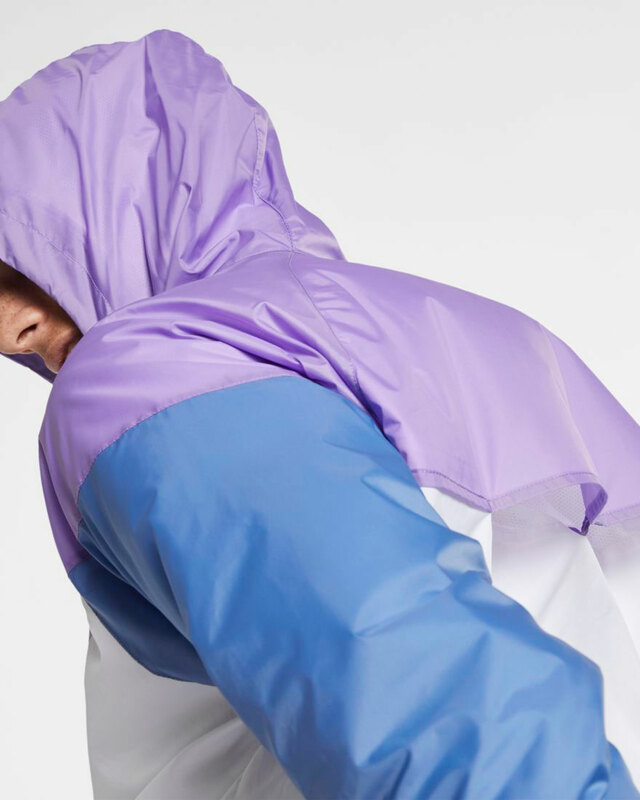 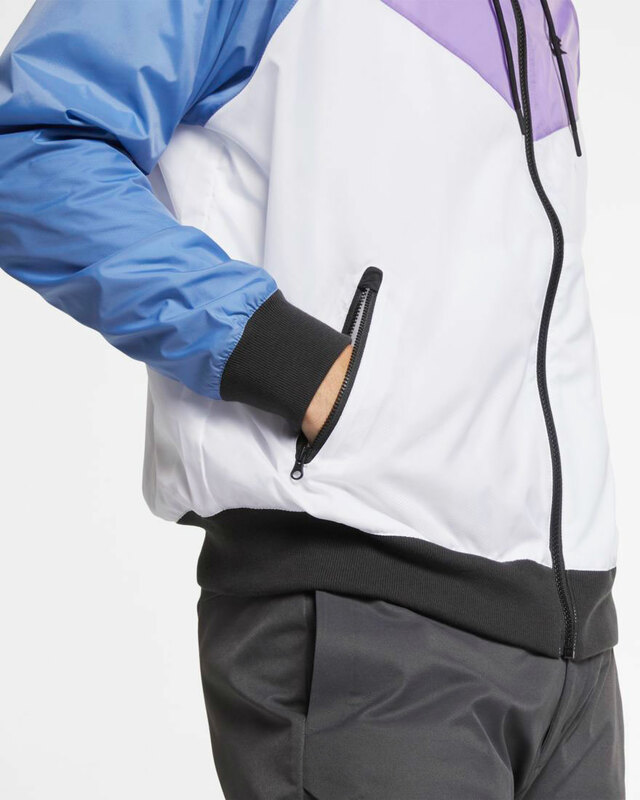 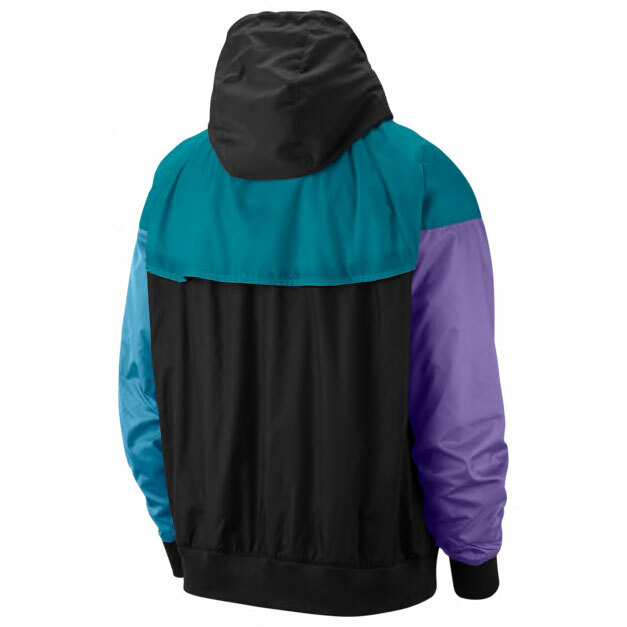 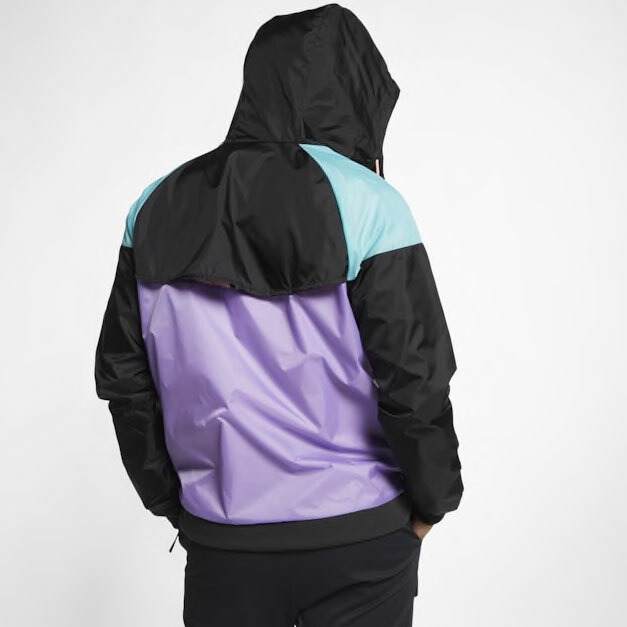 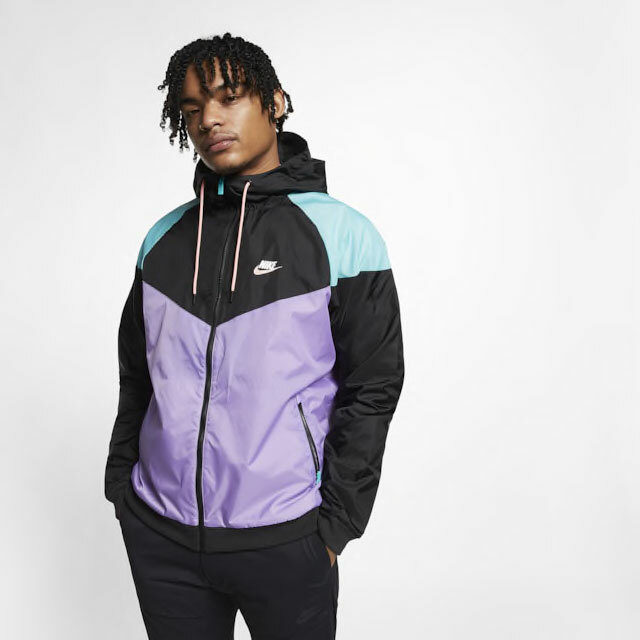 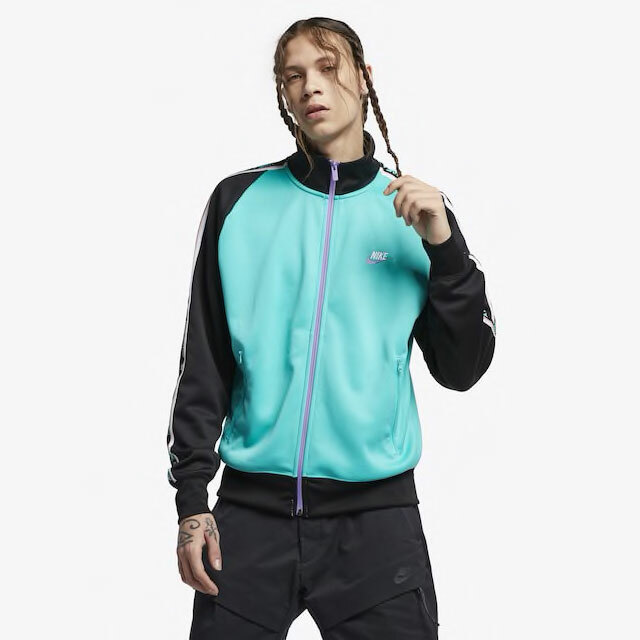 Bringing together the same colors that are featured on the shoes, this new Windrunner Jacket from Nike Sportswear’s Spring 2019 Collection keeps it light and bright for those cooler days, with tints of pink, purple, turquoise and black to match the sneaker pack which includes the Air Max 720, Air Max 270, Air Max Plus, Air Max Deluxe and other running shoe styles. 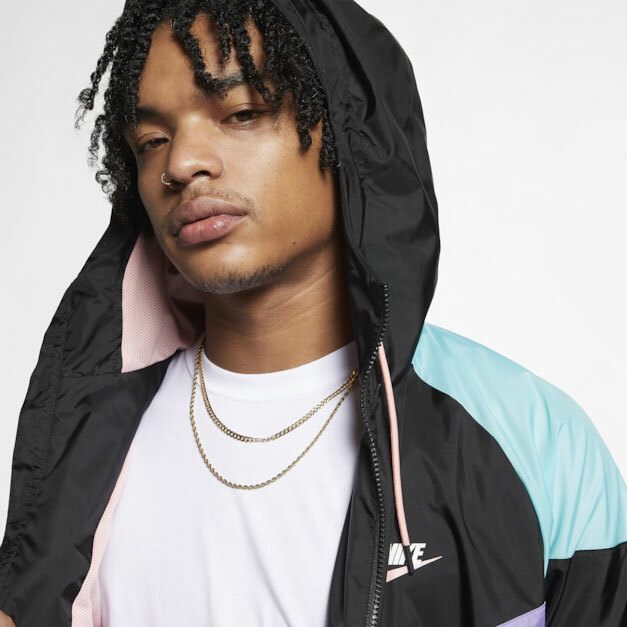 You can shop the jacket and sneakers below, with more Nike Throwback Future clothing available here. 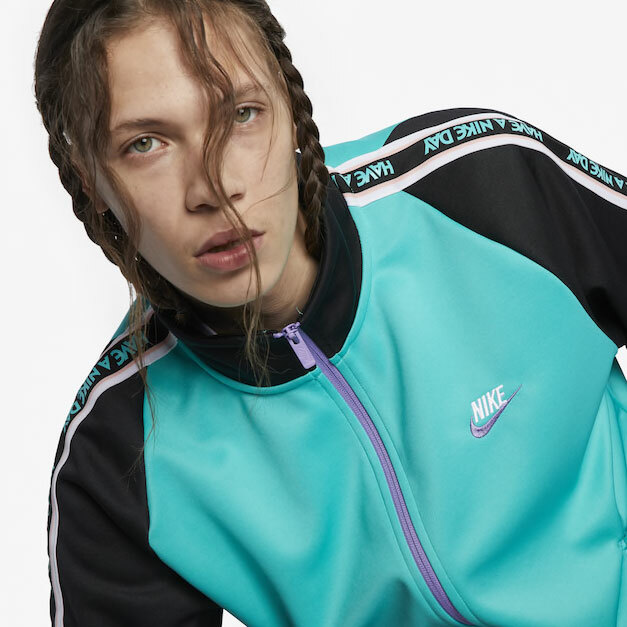 Nike Sportswear is fusing old school retro runners and modern design on the Nike “Throwback Future” Collection including sneakers and matching apparel. 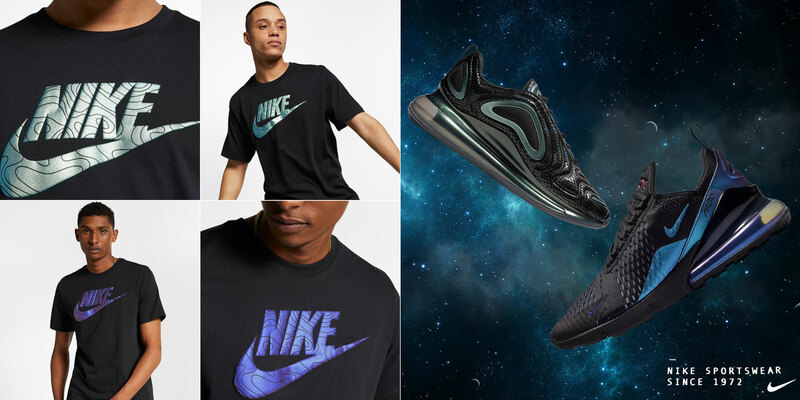 Bringing together some of the Swoosh’s most popular Air Max running shoes of the past, with today’s top technology and innovation, included in the collection are sneaker silhouettes like the Air Max 720, Air Max 270, Air Max Plus and Air Max Deluxe, with tops and shorts in colors to complement the kicks. 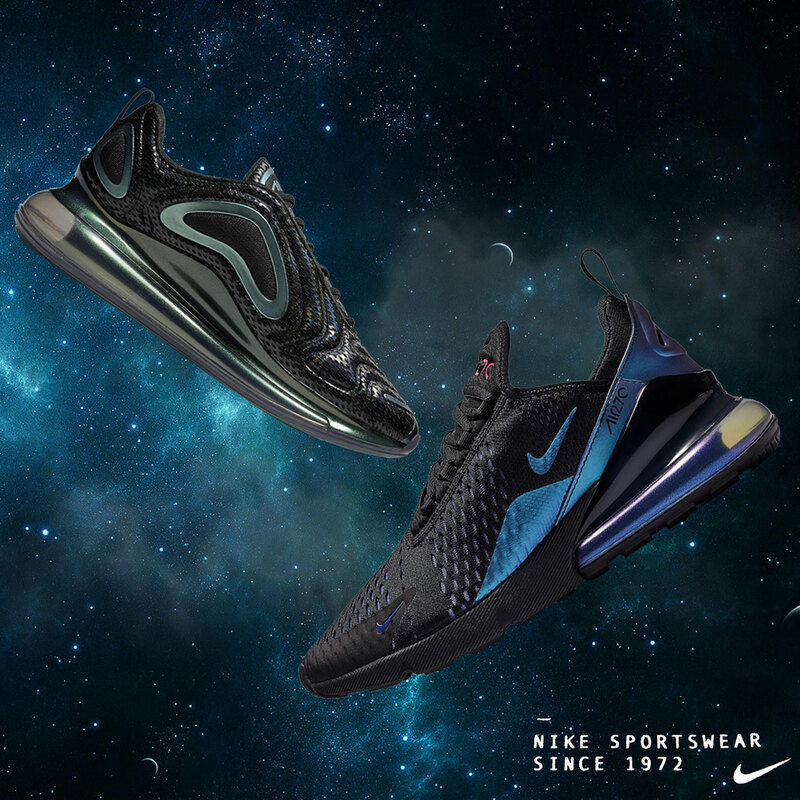 Check out Nike’s Throwback Future Collection with links to shop below. 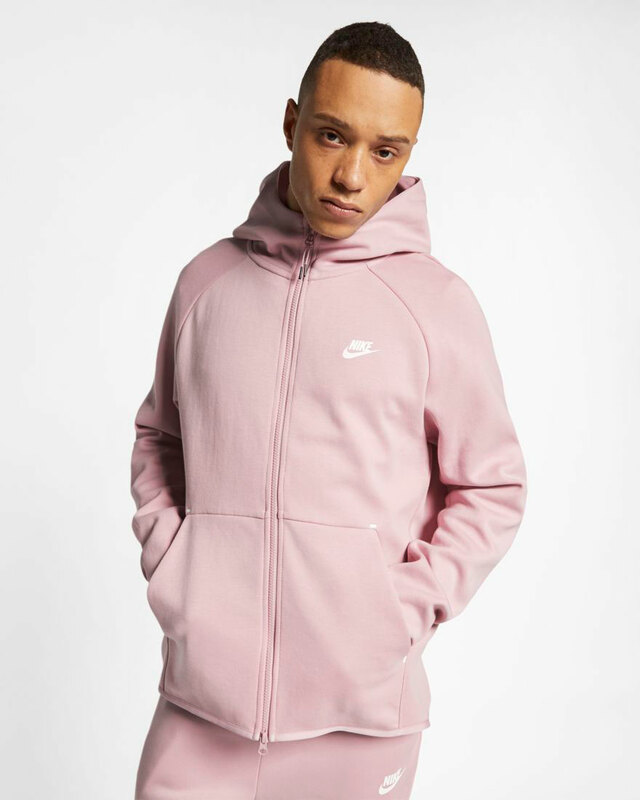 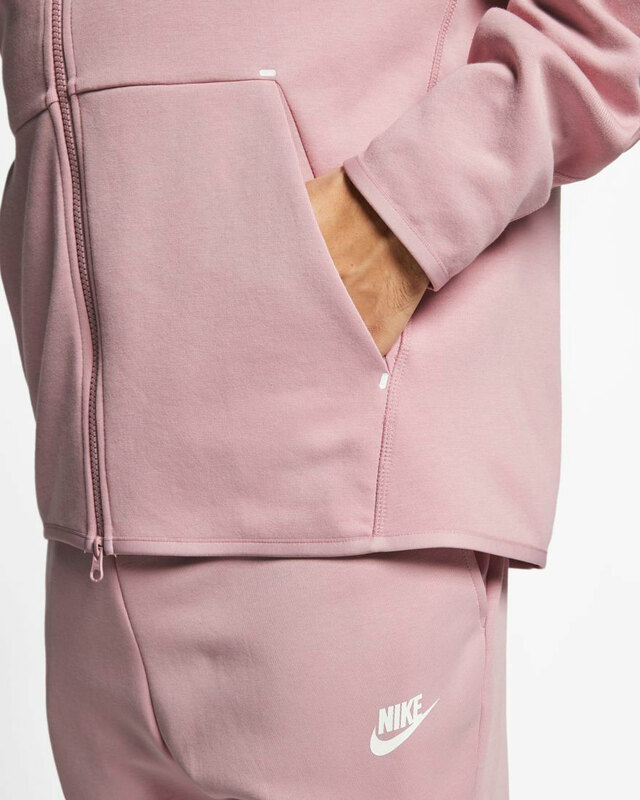 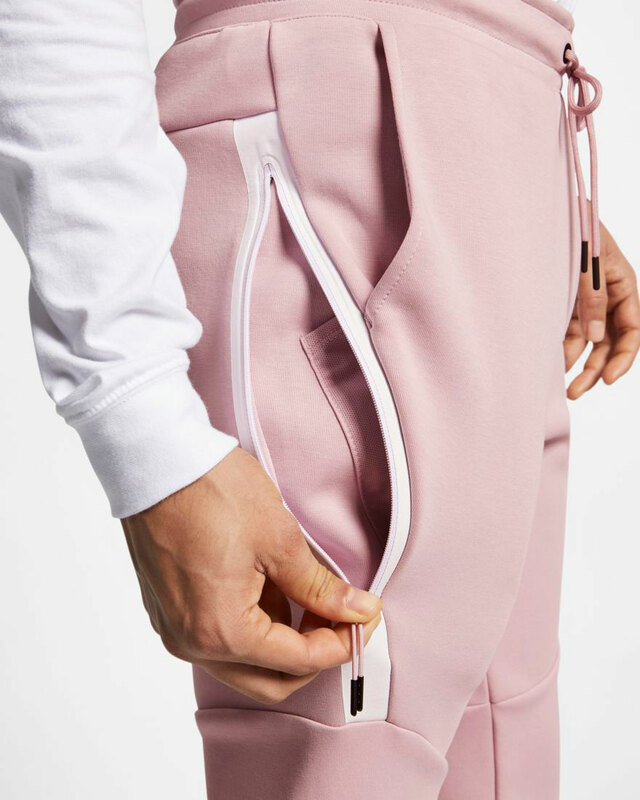 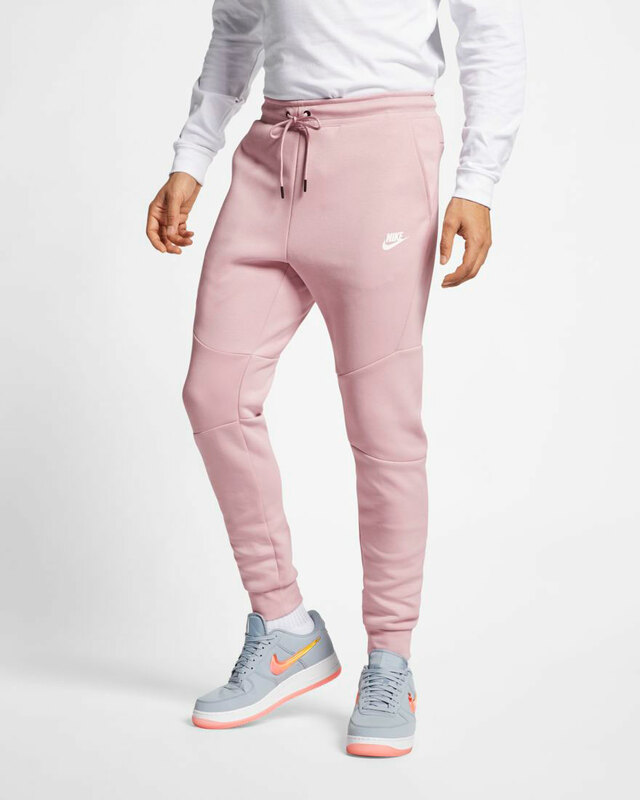 Popping up just in time for the start of spring is this new Plum Chalk Nike Tech Fleece Clothing Collection that’s a good match for the Nike Sportswear “Have A Nike Day” sneakers. 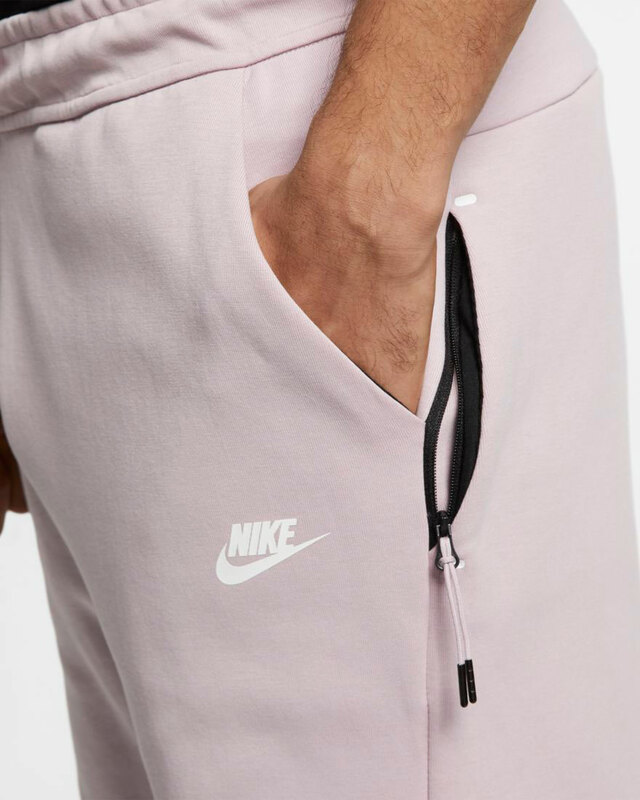 Pairing up nicely with the pale pink tint on the “Have A Nike Day” footwear pack, included in the Tech Fleece apparel range are Plum Chalk hoodie, joggers and shorts that keep it light and bright for the sunnier seasons. 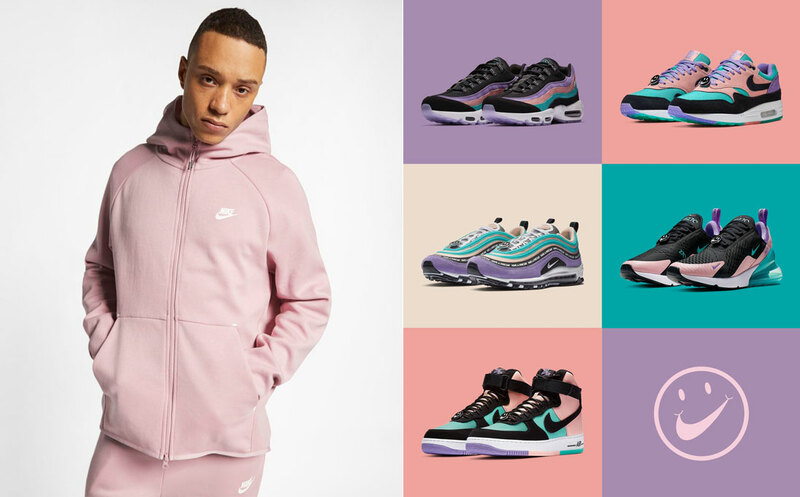 Check out all three Tech Fleece clothing styles, along with the Air Max 1, Air Max 95, Air Max 97, Air Max 270 and Air Force 1 sneakers below. 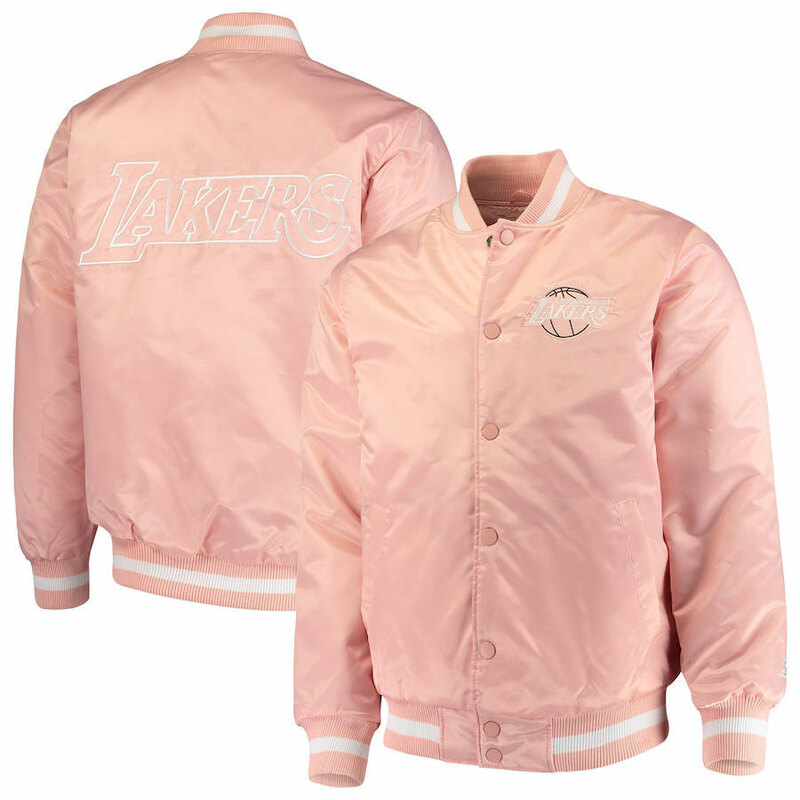 A new pack of Starter Pink Satin Full-Snap NBA Jackets have surfaced for spring which match well with Nike Sportswear’s “Have A Nike Day” sneaker collection. 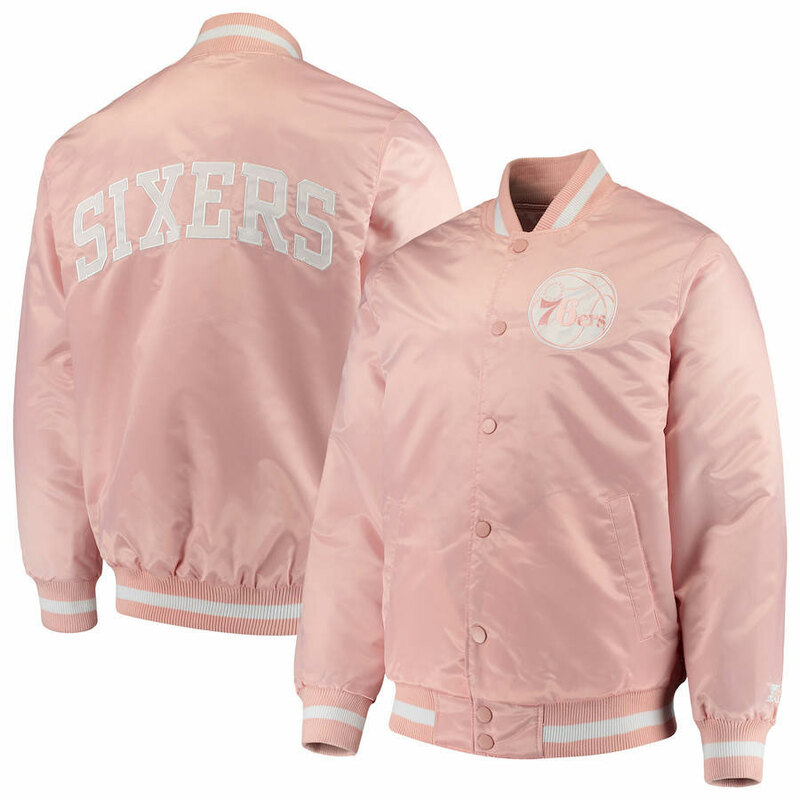 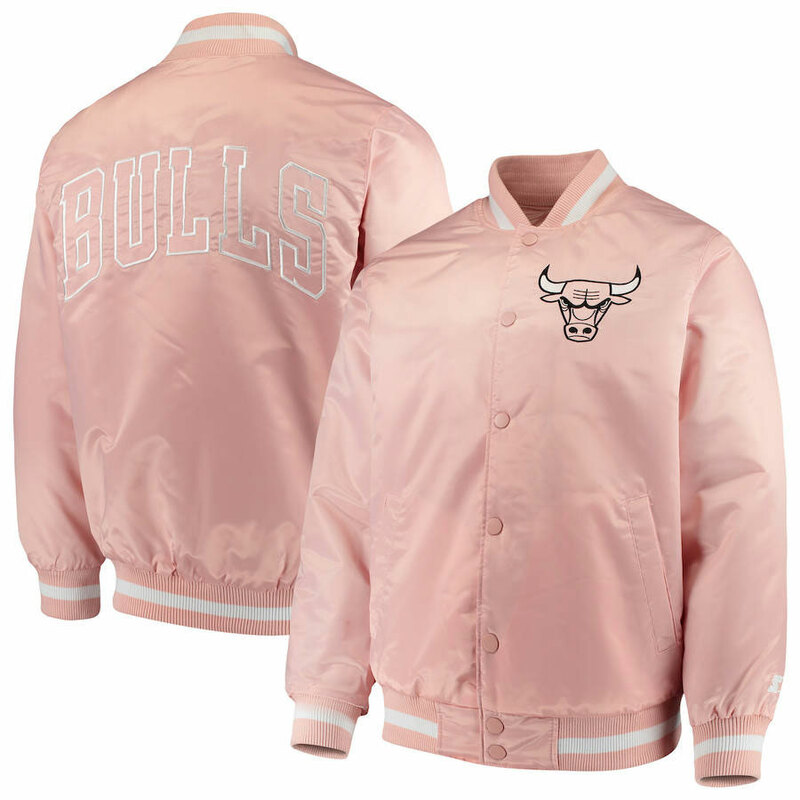 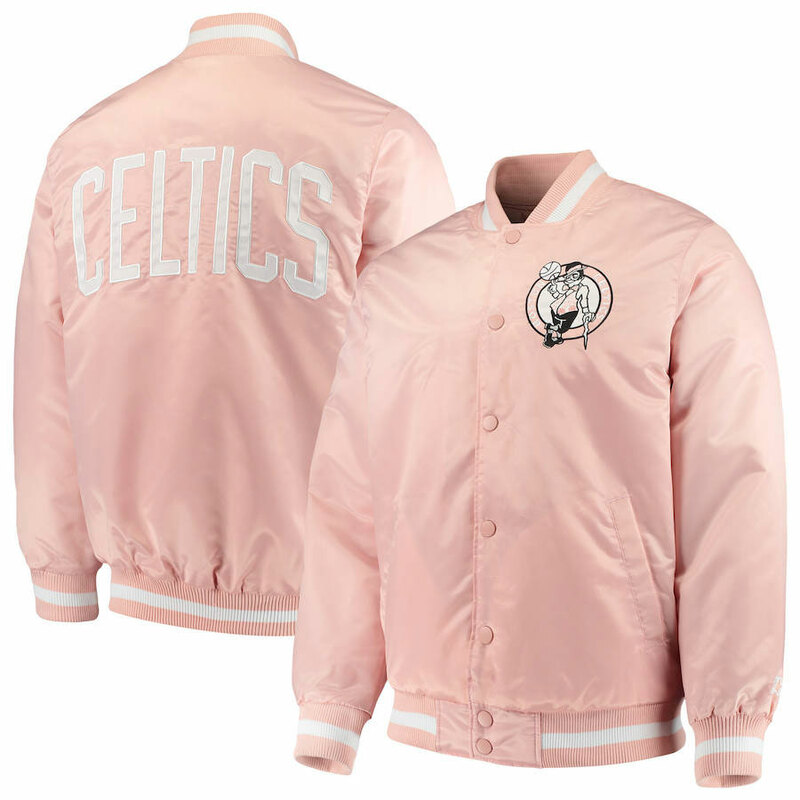 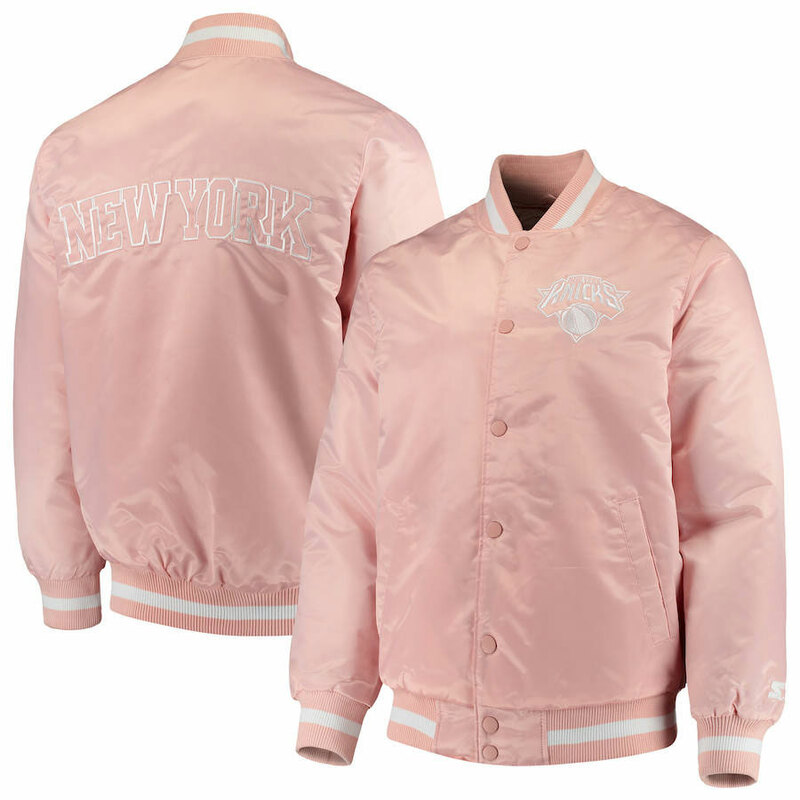 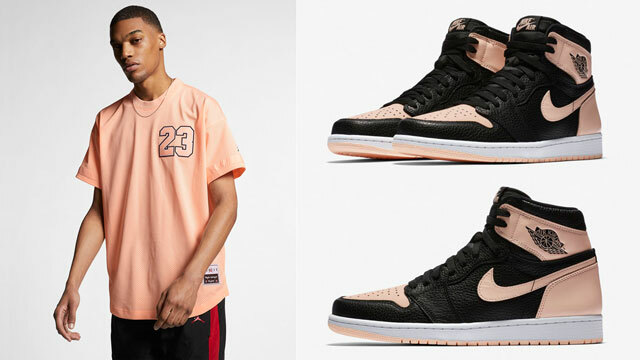 Featuring a pastel pink tint that pairs well with the Have A Nike Day footwear pack’s spring-ready color scheme, included in the Starter NBA jacket assortment are some of the league’s most popular teams like the Chicago Bulls, Golden State Warriors, Boston Celtics, New York Knicks, Los Angeles Lakers, Cleveland Cavaliers and Philadelphia 76ers. 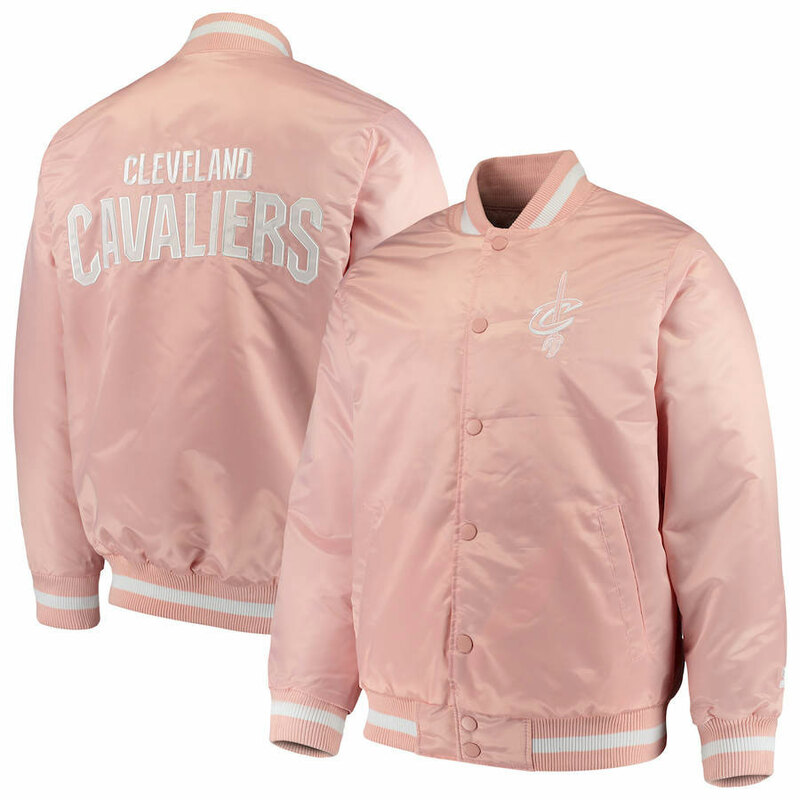 Check out all of the Starter Pink Satin Full-Snap NBA Jackets and Nike’s “Have A Nike Day” sneakers with links to shop below. 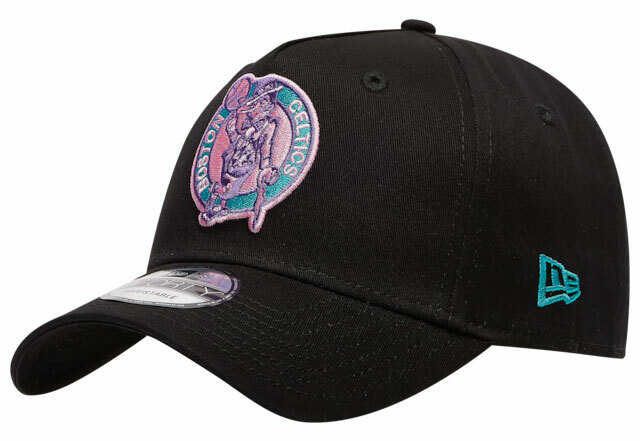 Perfect for pairing up with Nike Sportswear’s Have A Nike Day Collection are these New Era NBA and MLB 9FORTY Spring Snapback Hats to hook with the kicks. 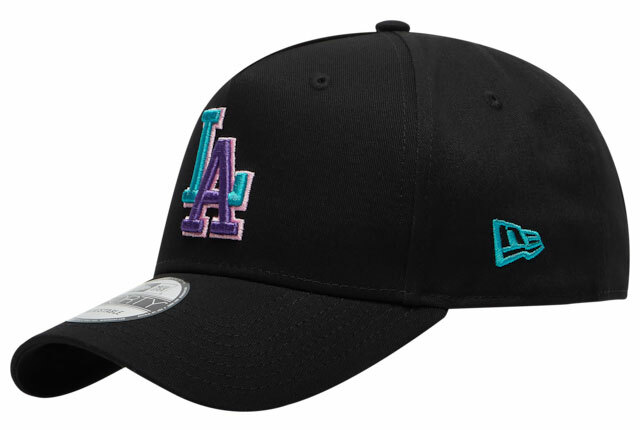 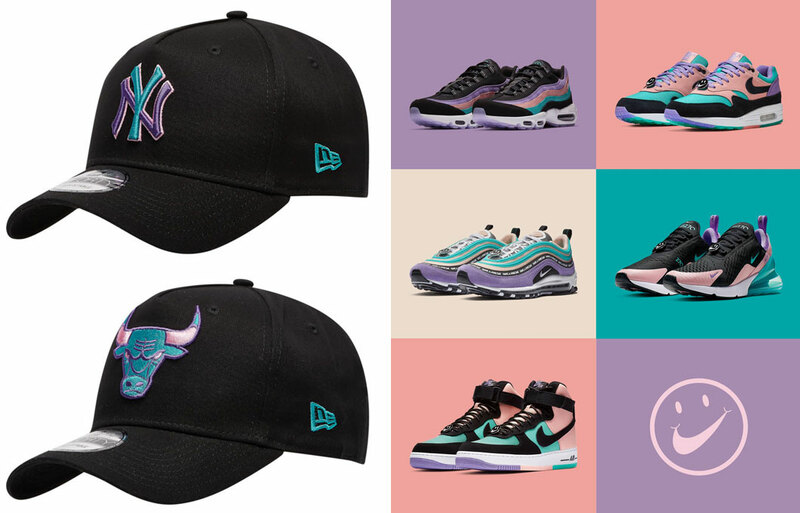 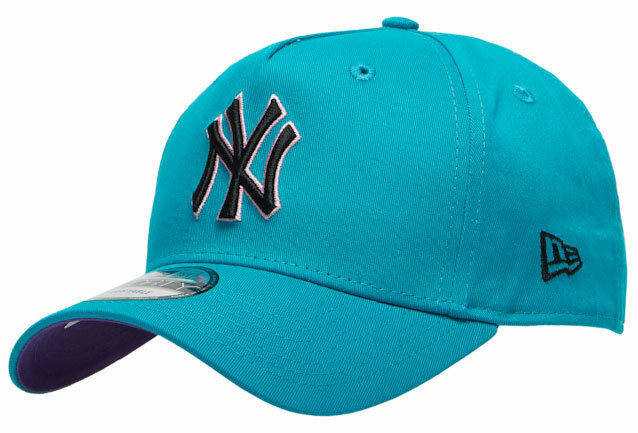 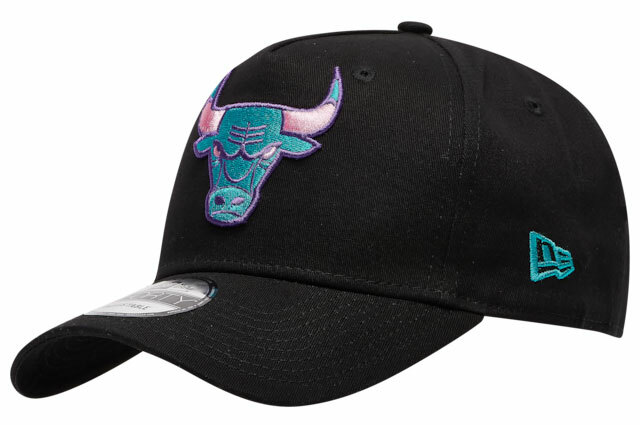 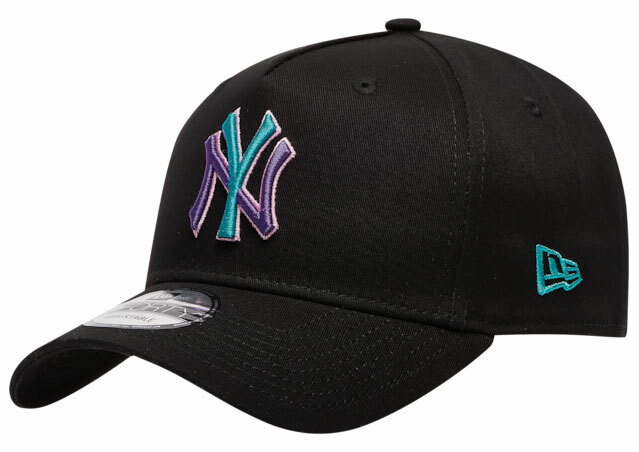 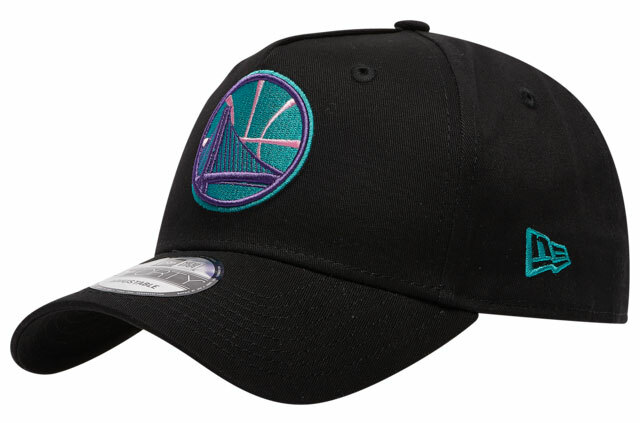 Looking to the shoes for color cues, included in the 9FORTY Spring Snapback Cap Collection are NBA teams like the Bulls, Lakers, Celtics, Spurs, Warriors, Rockets, 76ers and Heat, as well as MLB teams to top off your look like the Yankees, Dodgers and Braves caps in teal, pink and black. 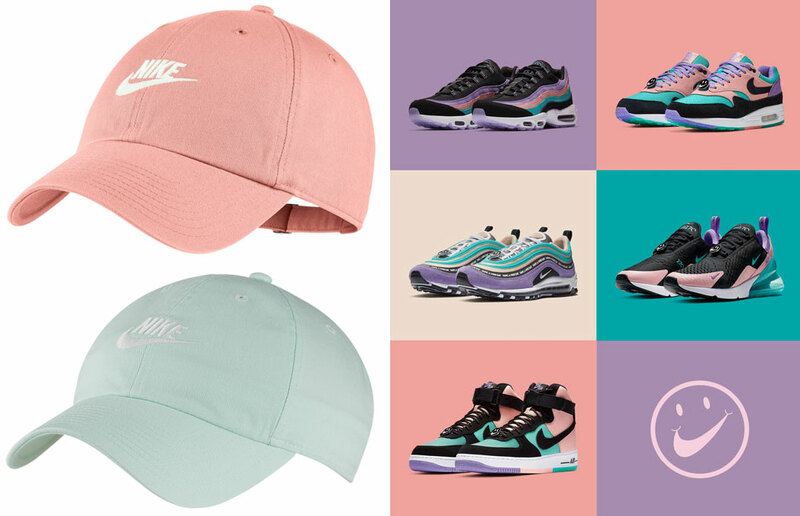 Whether you’re lacing up the Air Max 1, Air Max 95, Air Max 97, Air Max 270 or Air Force 1s this spring, finish your fit from top to bottom with these New Era snapback caps to match. 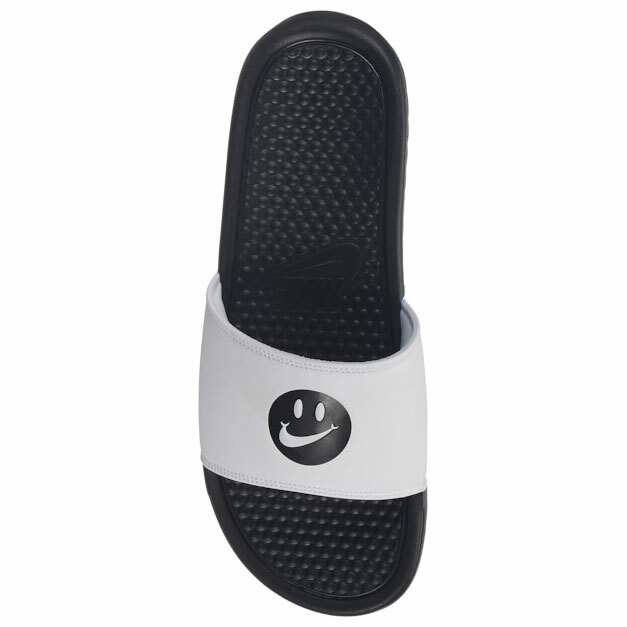 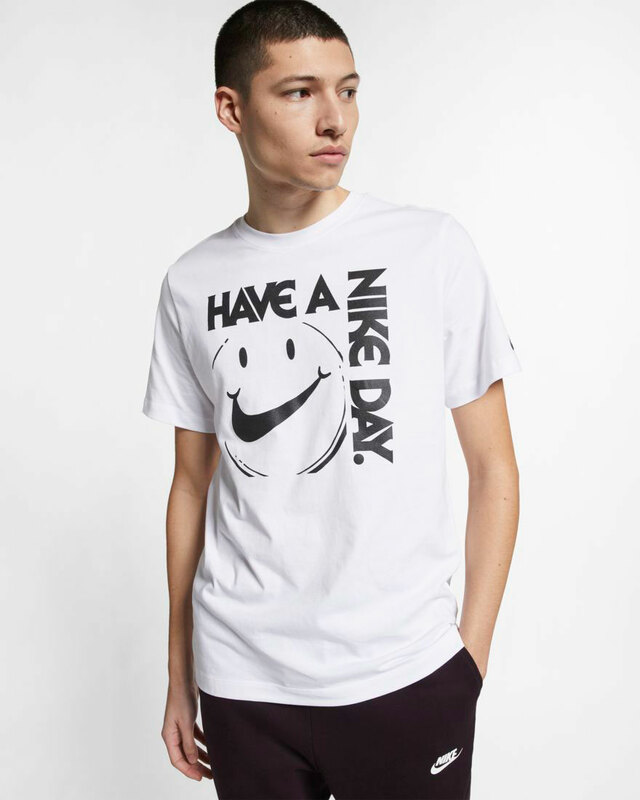 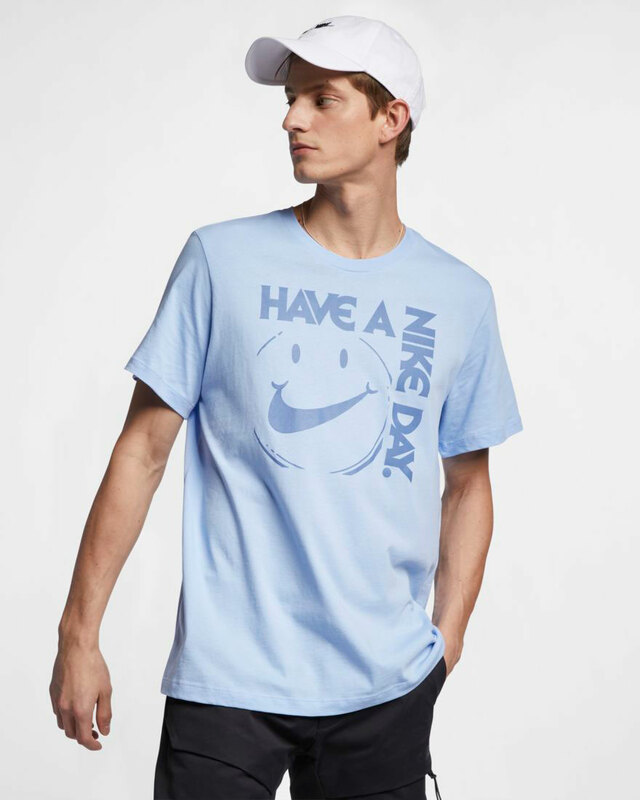 Dropping alongside the smiley faced Swoosh tees that first surfaced are a few new “Have A Nike Day” T-Shirts, sneakers and slides to sport during the spring and summer seasons. 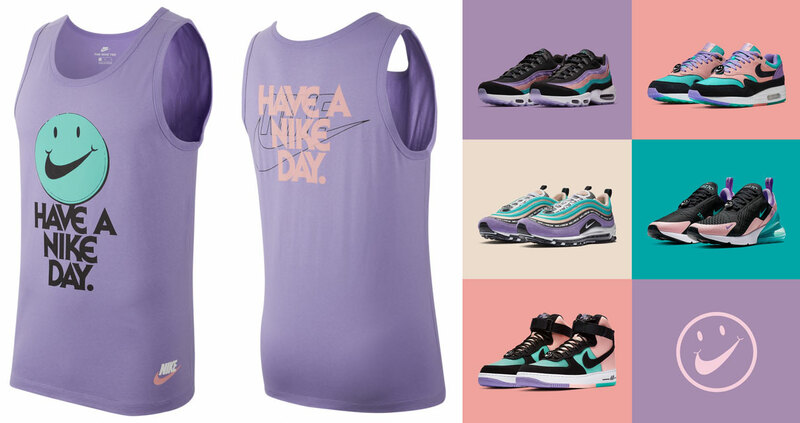 Popping with pastel tints and retro style, included in the Have A Nike Day Collection are purple, pink, black and white tees, as well as the Nike Benassi JDI Slides to help keep your feet cool in the heat, plus a complete sneaker pack in matching colors with silhouettes like the Air Max 1, Air Max 95, Air Max 97, Air Max 270 and Air Force 1s to choose from. 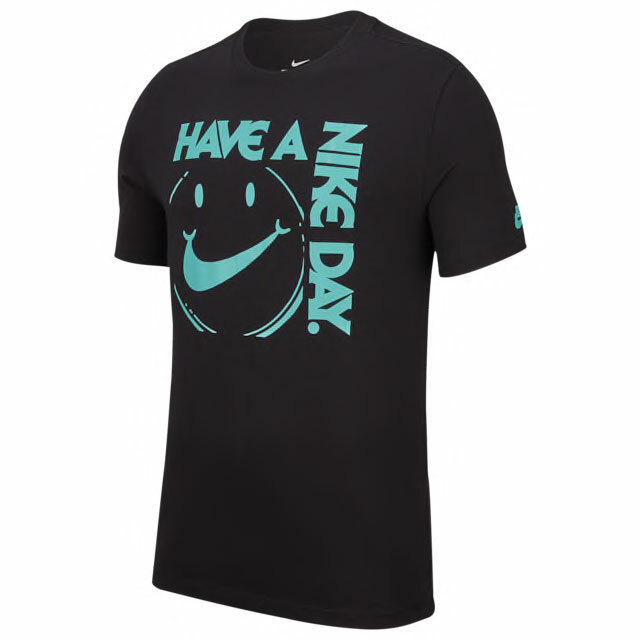 Check out the new “Have A Nike Day” T-Shirts, sneakers and slides with links to shop the gear below. 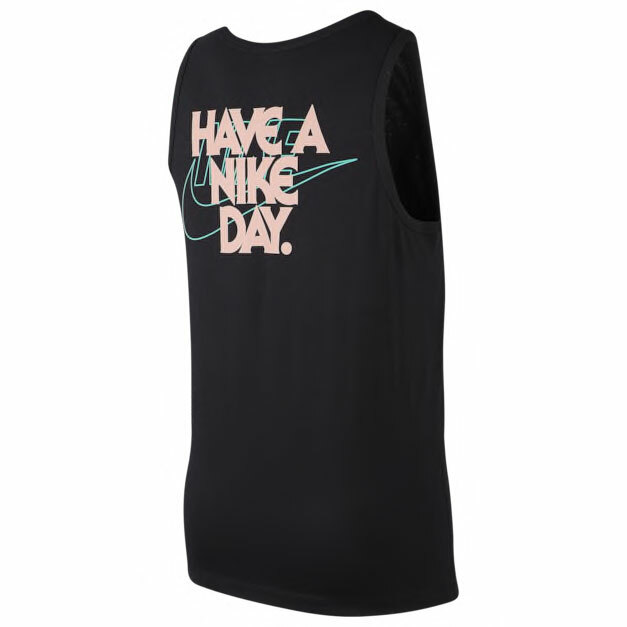 With the warm weather coming up and Air Max Day taking place on March 26th, Nike Sportswear has some new tank tops available for spring to match the “Have A Nike Day” sneaker pack. 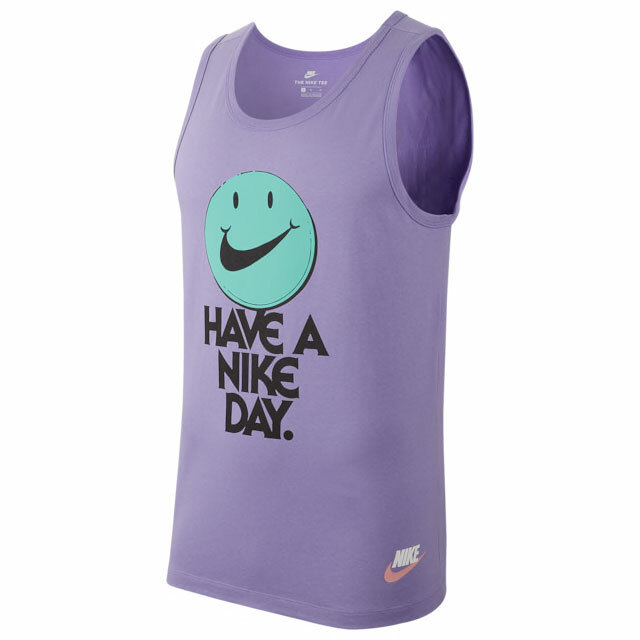 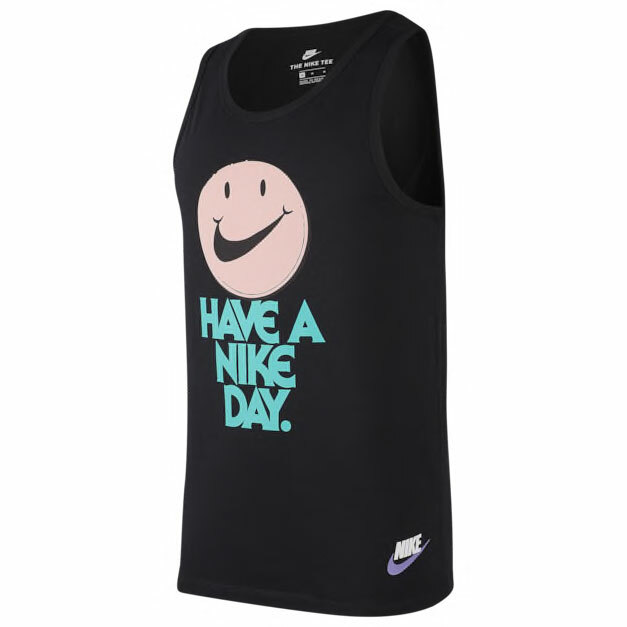 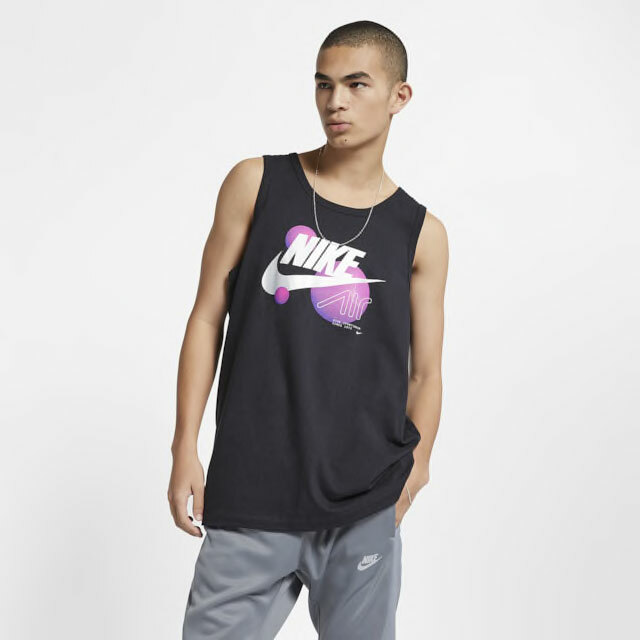 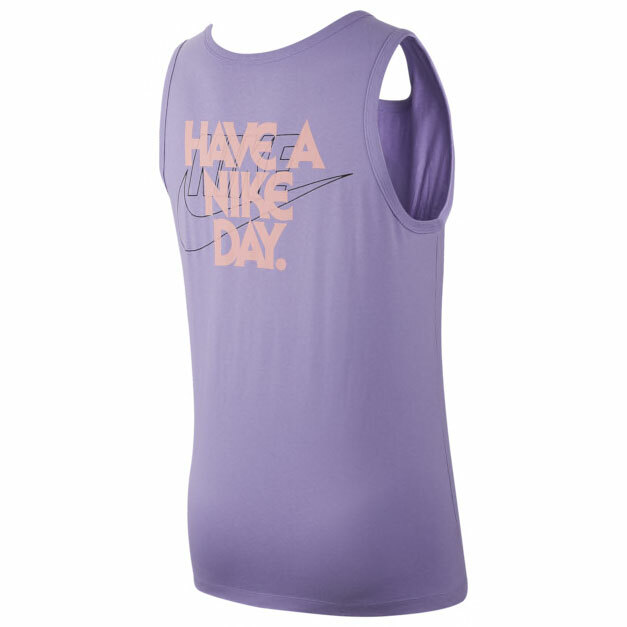 Mixing pastel tints with a retro touch, the Nike Sportswear “Have A Nike Day” Tank features the smiley faced Swoosh character on the front and the friendly memo mentioned on both sides. 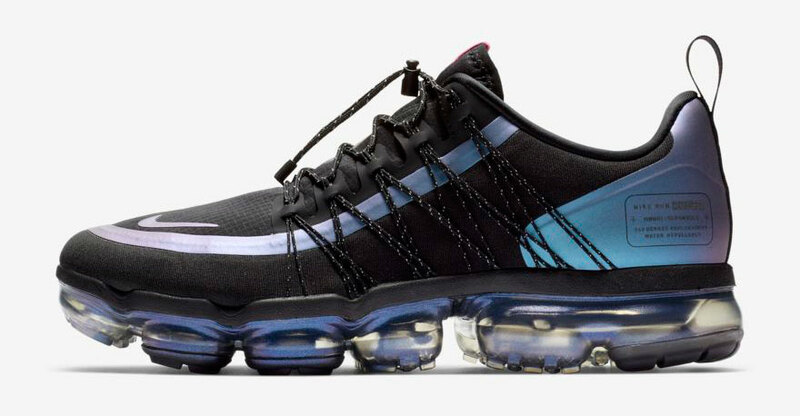 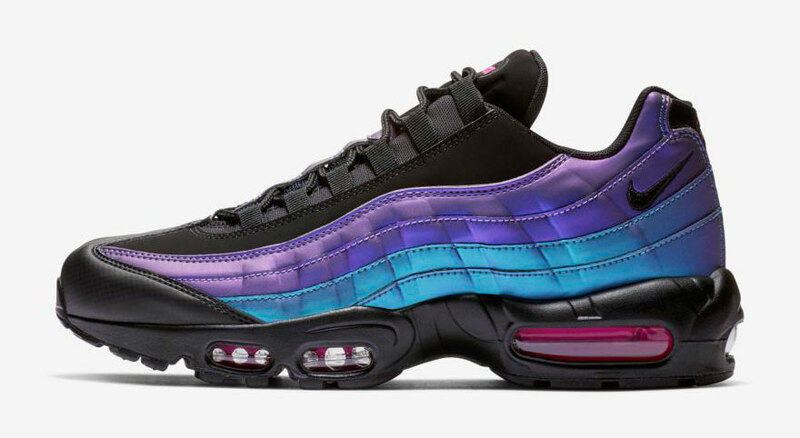 You can grab the tank in purple or black, along with all of the kicks to match like the Air Max 1, Air Max 95, Air Max 97, Air Max 270 and Air Force 1s through the links below. 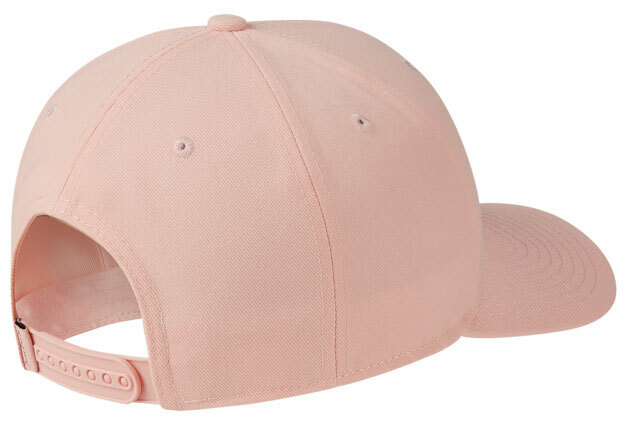 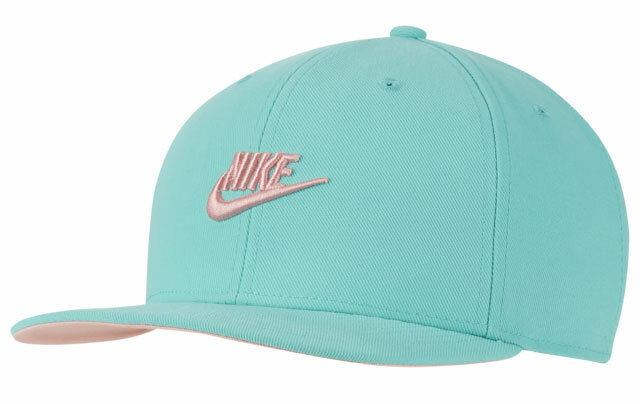 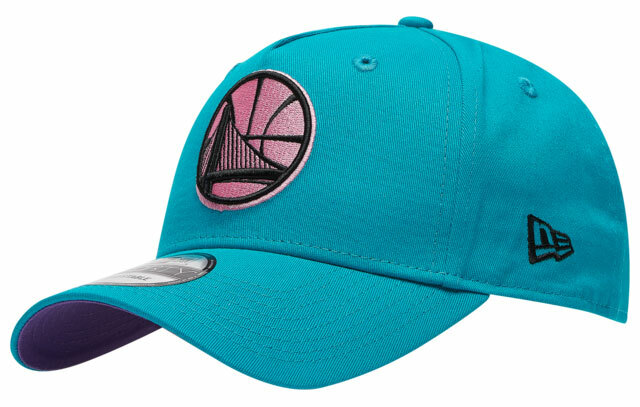 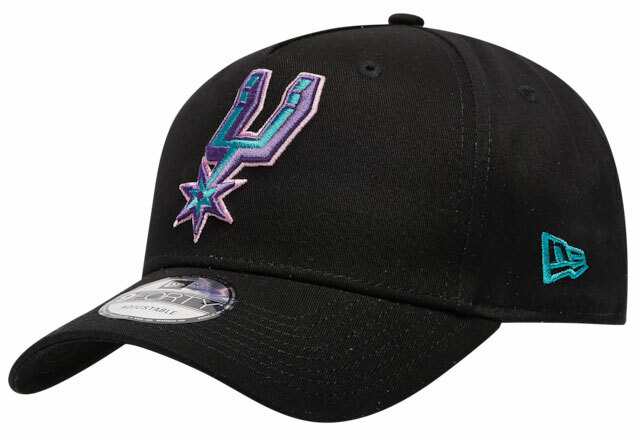 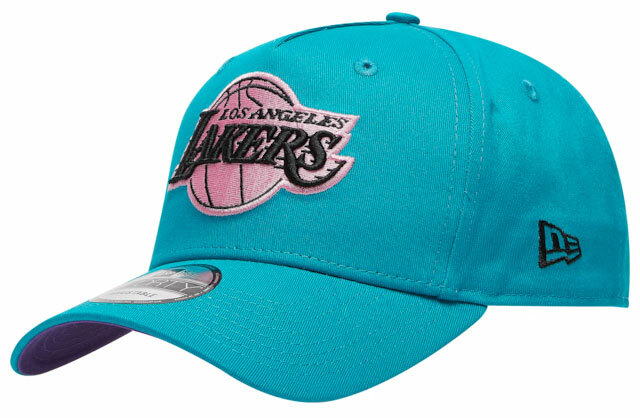 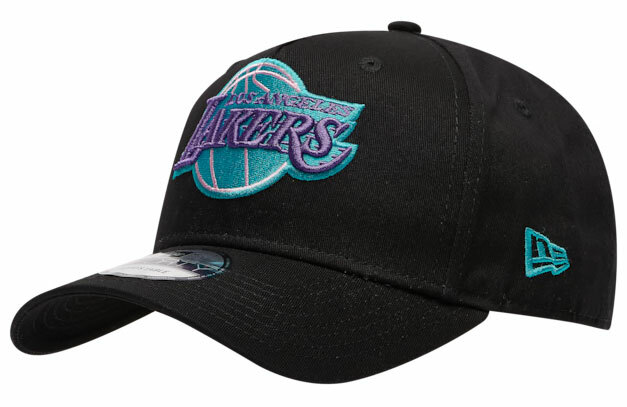 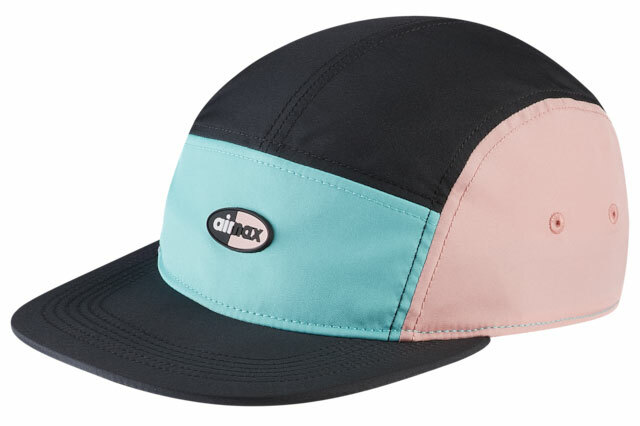 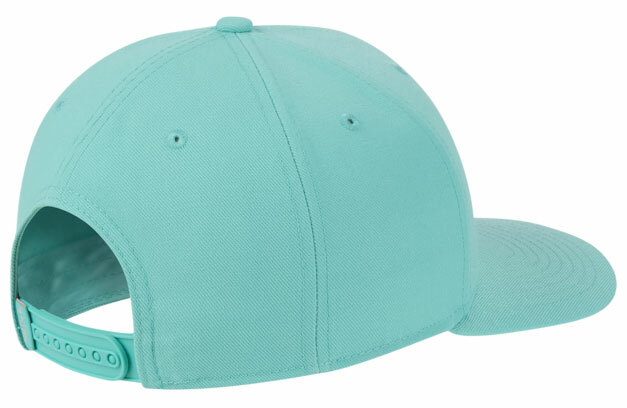 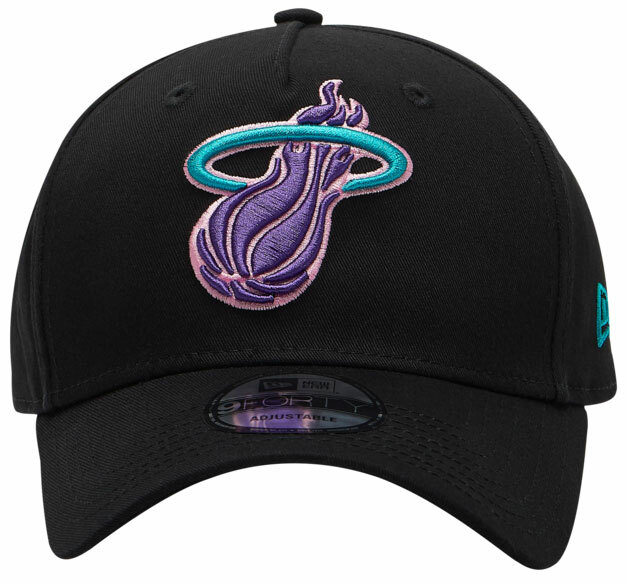 Two new pastel colored snapback caps have popped up as part of the Swoosh’s Have A Nike Day Collection including these teal and pink hats to hook with the pack’s kicks and clothing. 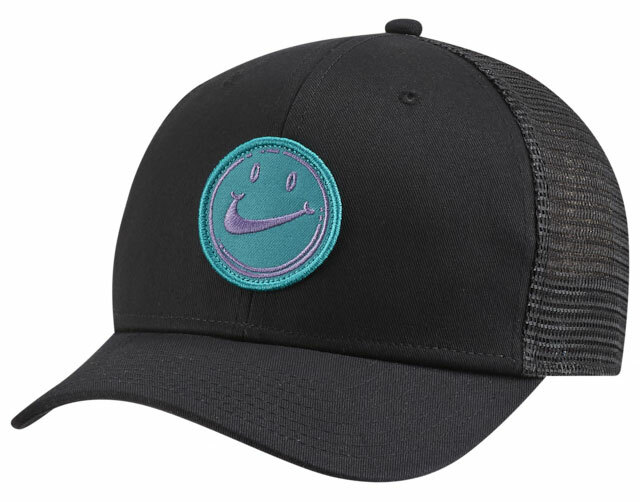 Available alongside these other Have A Nike Day hats and hip packs, both Nike Futura Precurve Snapback Caps feature bright color schemes that are perfect for spring and summer, with retro style, adjustable strap closure and moisture-wicking material to help keep your head dry during those warmer days. 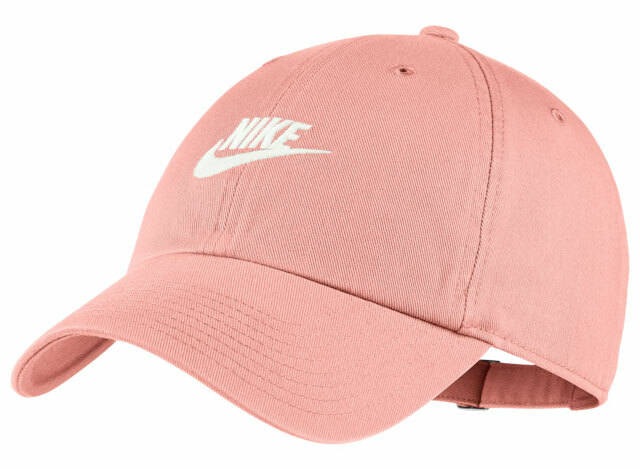 You can cop the caps and kicks to match below. 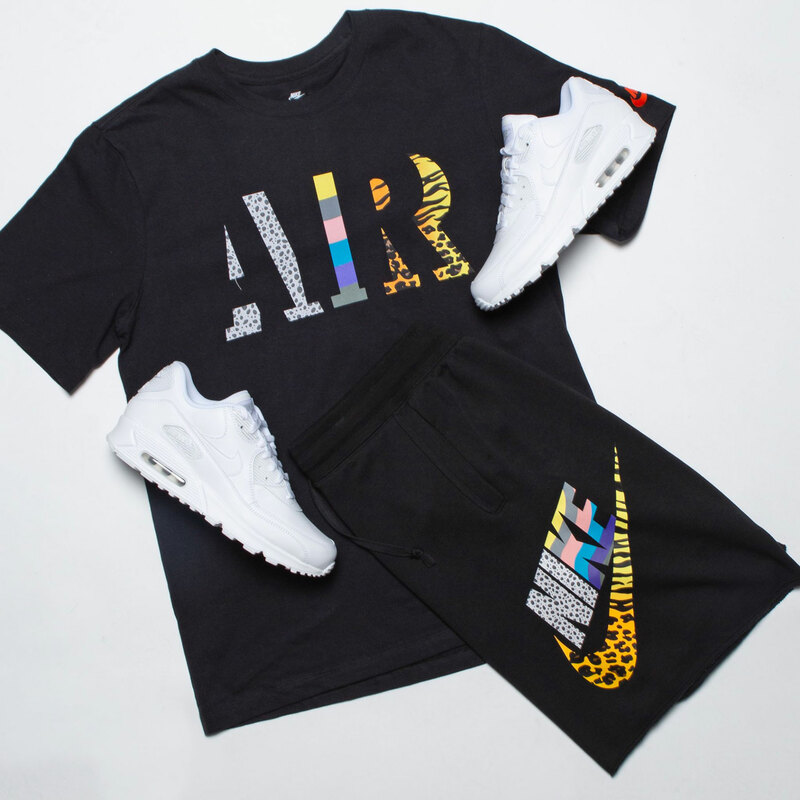 Dropping ahead of this year’s annual Air Max Day celebration which takes place on March 26th are these Nike Air Max Day Culture T-Shirts and Alumni Shorts that pay tribute to some of the most iconic Air Max retro models. 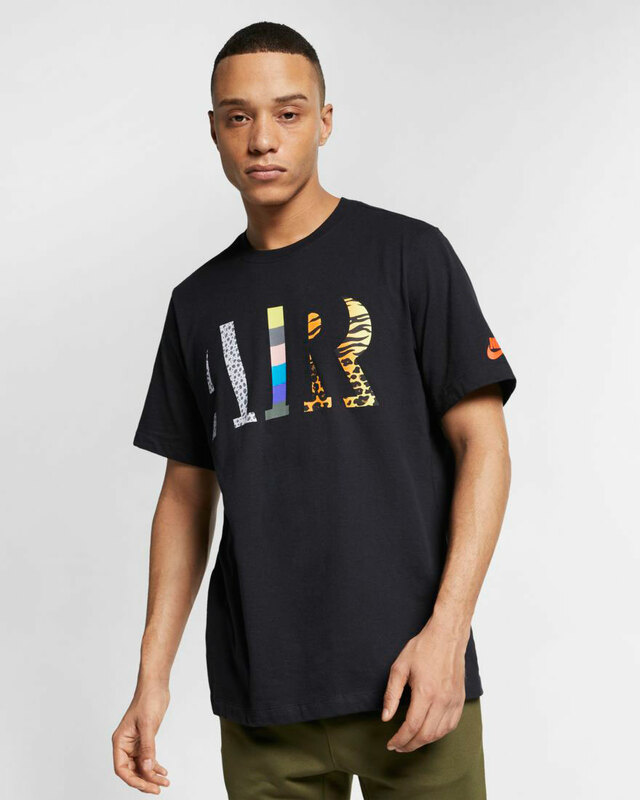 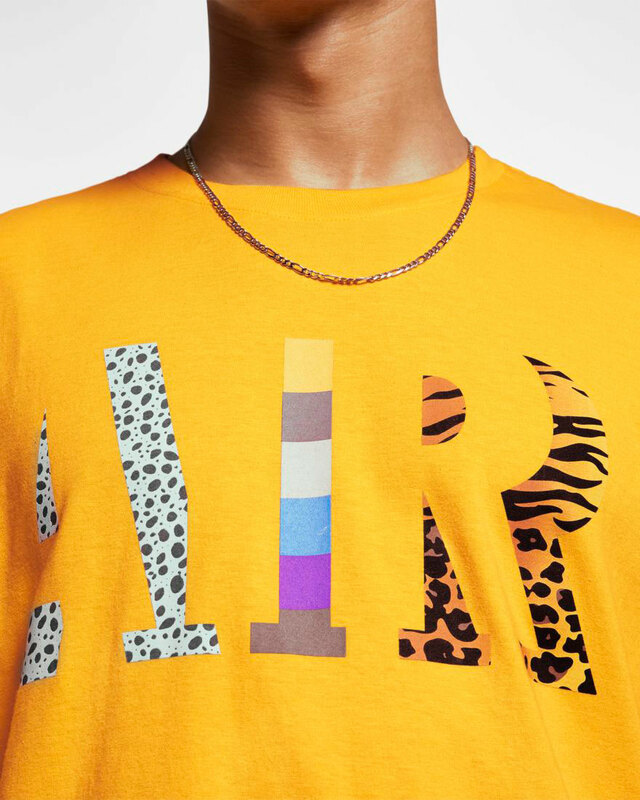 Mixing in classic graphics from Nike’s Safari styles, as well as stripes from Sean Wotherspoon’s Nike Air Max 1/97 which was a hit during last year’s Air Max Day, included in the AMD Culture apparel line are black and yellow tees, as well as a matching pair of Nike AMD Culture Alumni Shorts to sport during the warmer seasons. 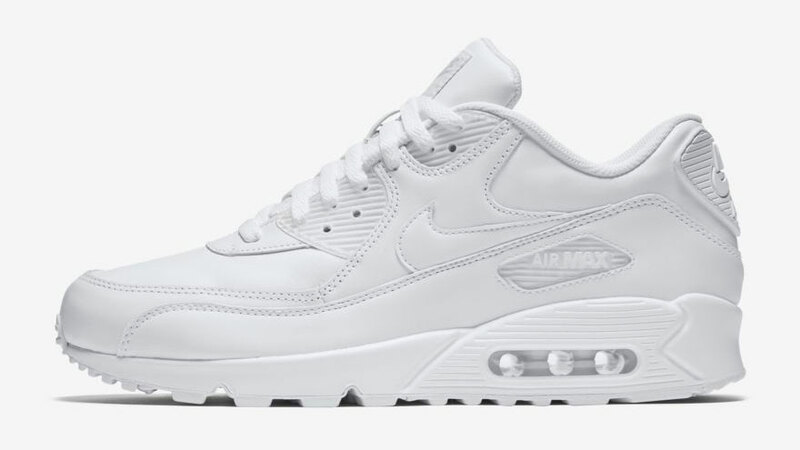 Completing the fit from the feet up are the “Triple White” Air Max 90s to lace up with the clothing for a classic retro sneaker look to hook. 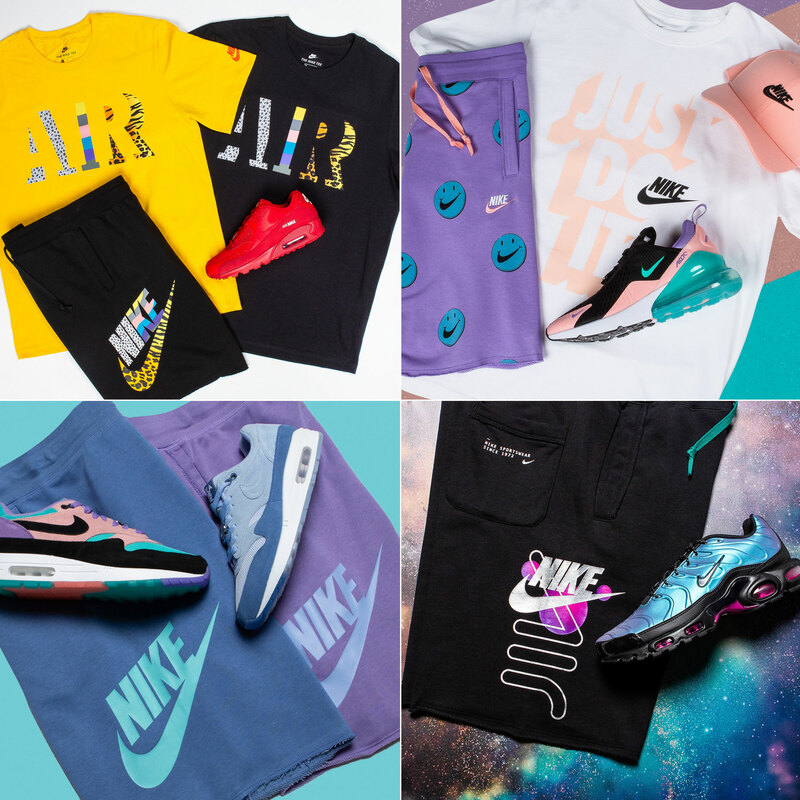 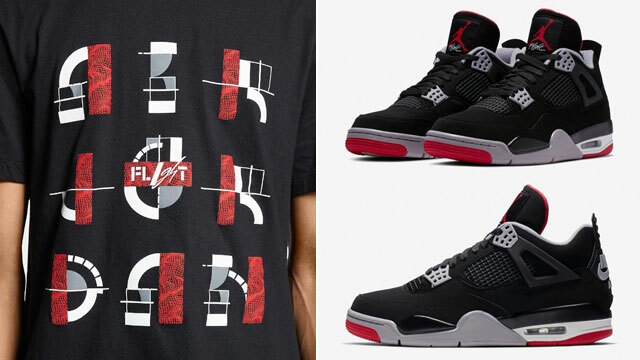 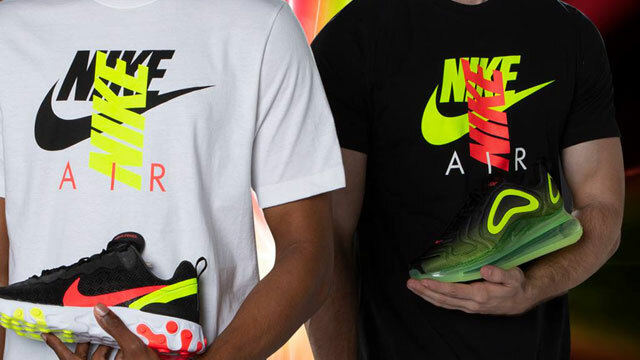 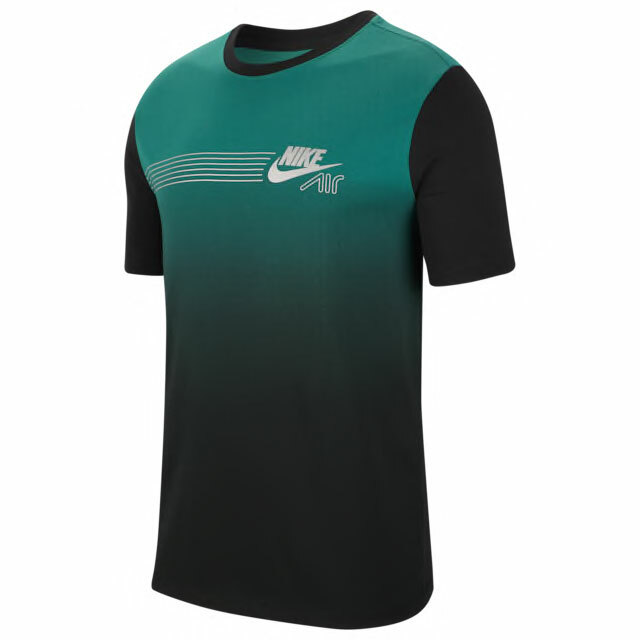 You can shop the Nike Air Max shirts, shorts and shoes below. 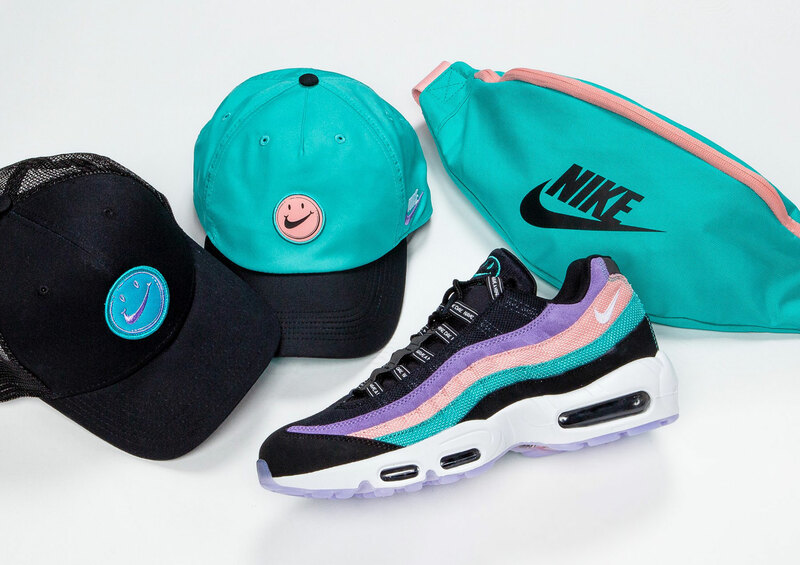 Hooking up with the Have A Nike Day sneakers and clothing are these new Nike Sportswear hats and hip pack to pair up with the kicks and gear. 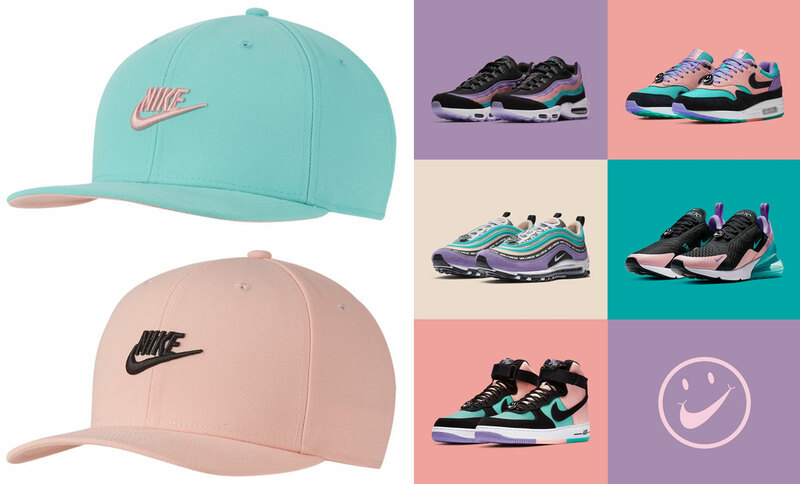 Giving you a few different headwear styles to choose from, along with some Have A Nike Day Hip Packs to complete the look, included in the cap collection are Nike Sportswear Trucker, H86 Adjustable and AW84 Air Max hats to top off your look when Air Max Day rolls around on March 26th. 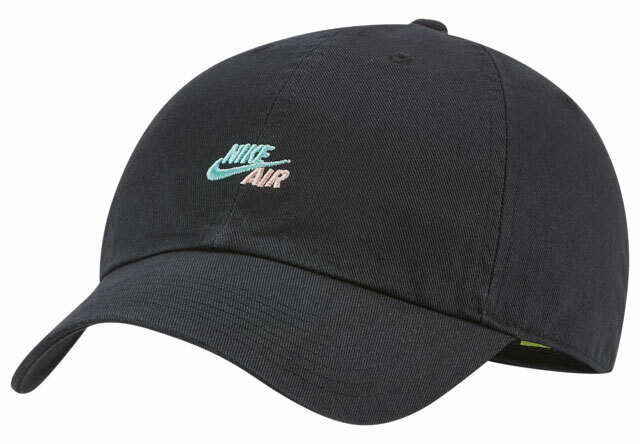 You can shop the Have A Nike Day hats, hip pack and sneakers from Nike Sportswear below. 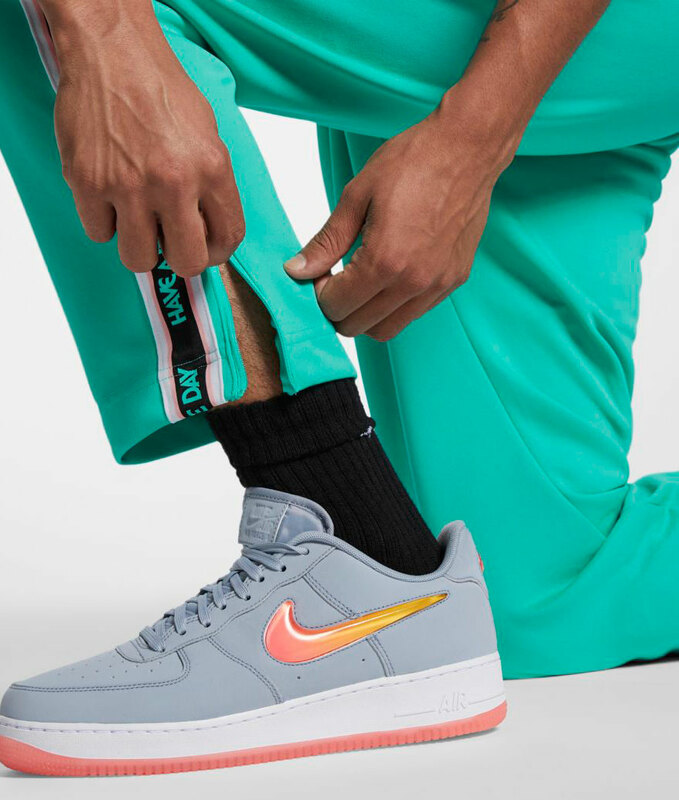 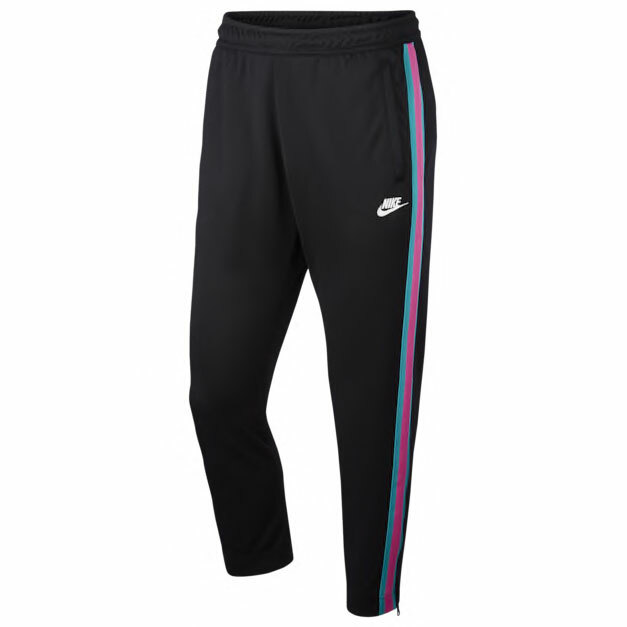 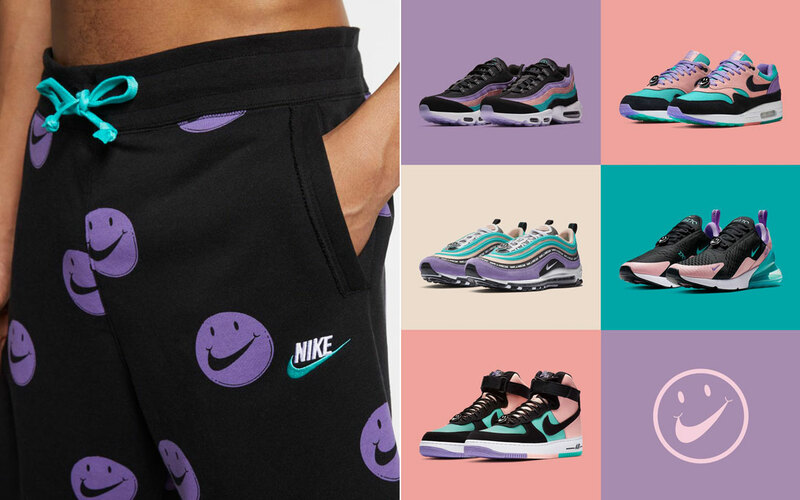 Perfect for pairing up with the Nike Day Tribute Jacket and matching footwear collection are these Nike Day Tribute Pants to slide on with the sneakers and gear. 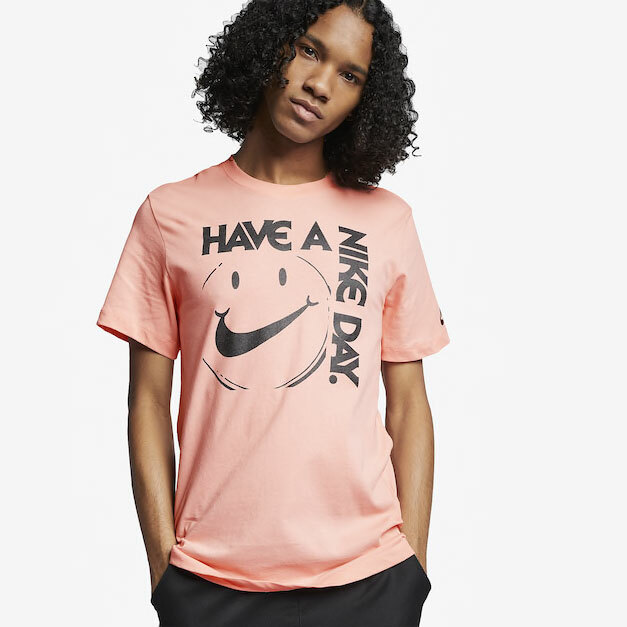 Featuring “Have A Nike Day” printed along the leg seams just like the sleeves of the jacket, with pastel colors to match the rest of the collection’s shoes, apparel and accessories, these loose-fitting athletic pants also have side and back pockets for storage, plus zippered cuffs so you can wear them loose or slightly tapered when lacing up the kicks. 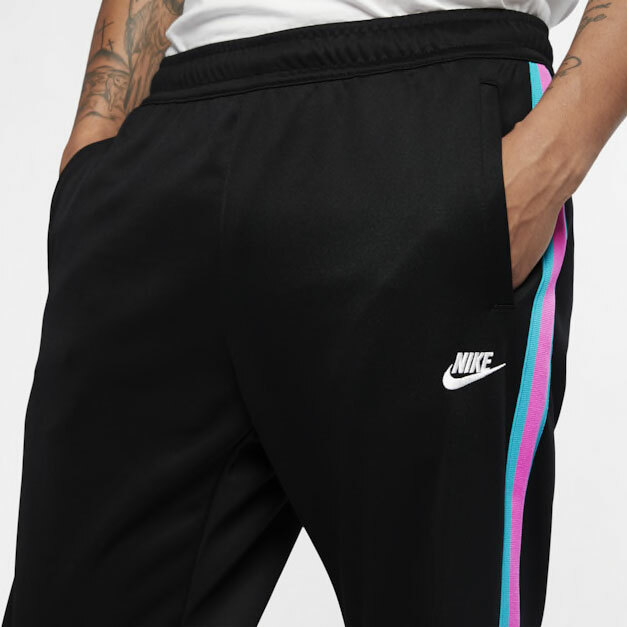 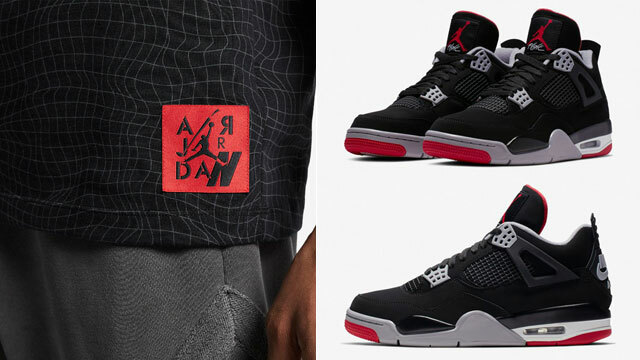 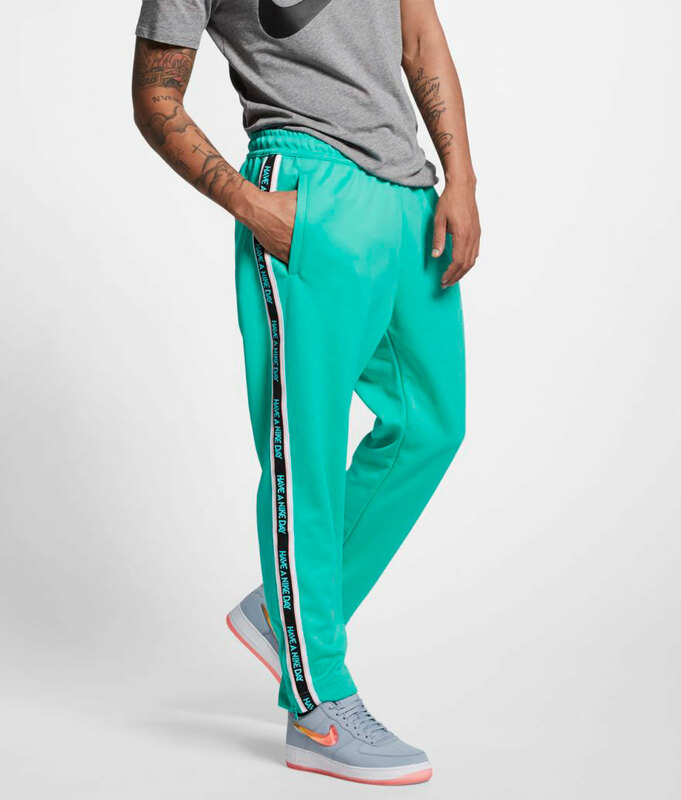 You can pick up a pair of these Nike Day Tribute Pants along with all of the Have A Nike Day sneakers to match below. 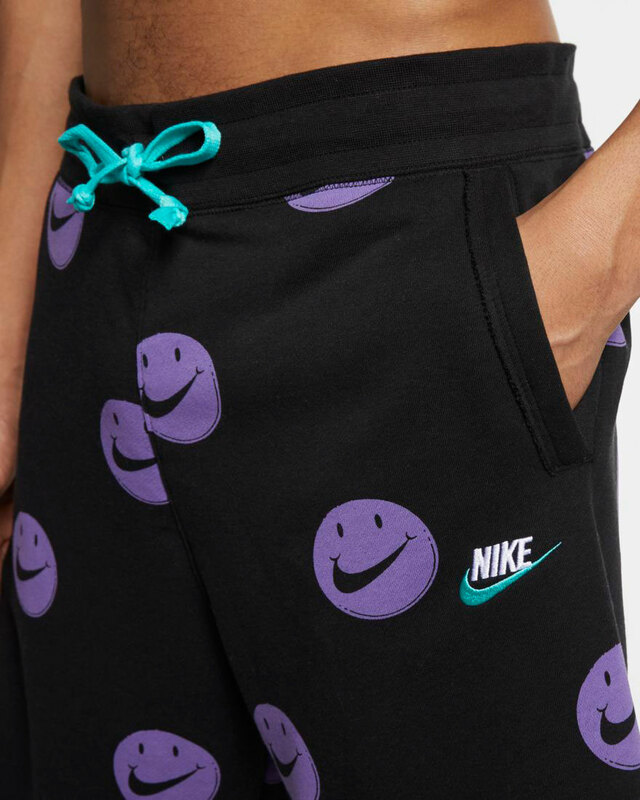 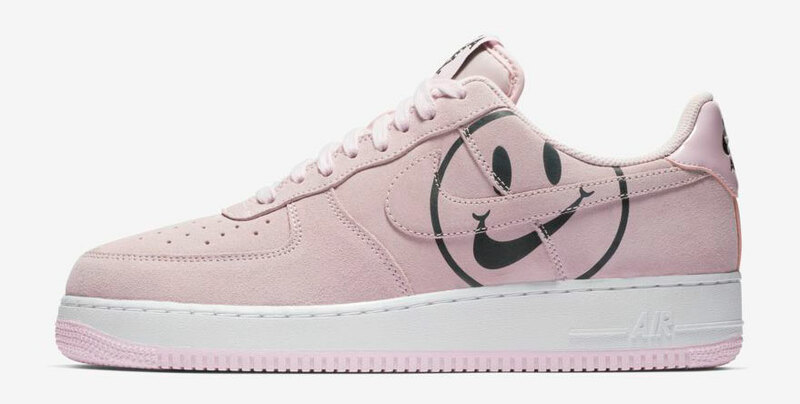 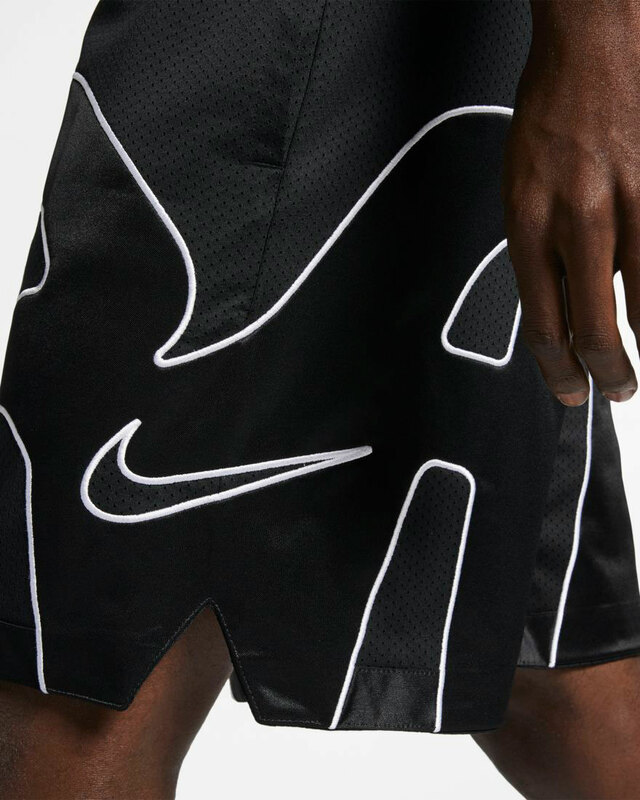 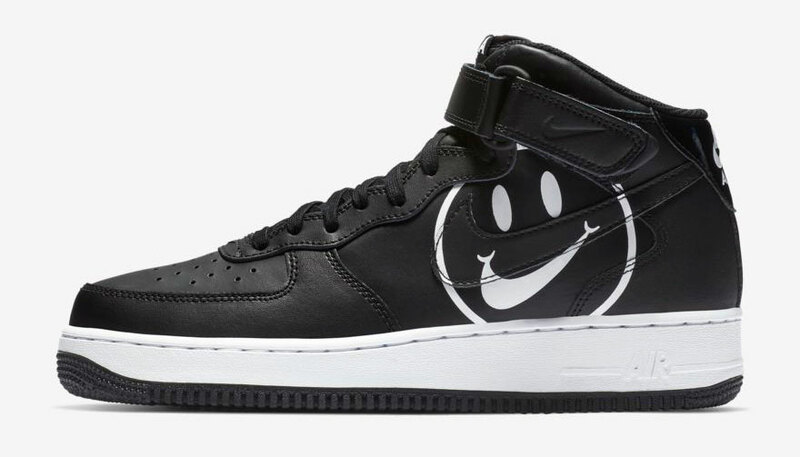 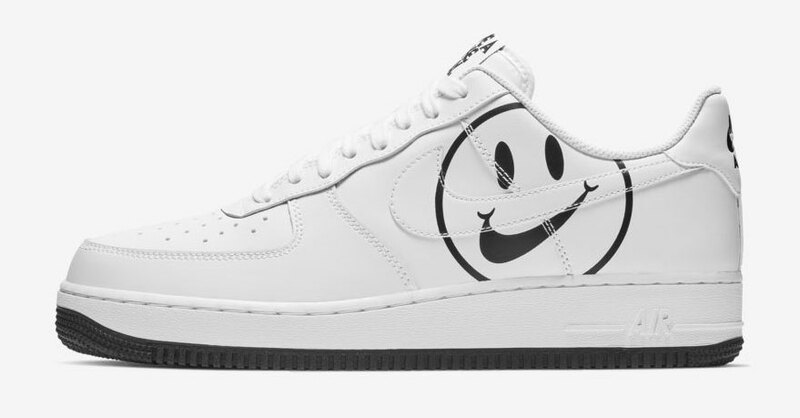 Nike Sportswear’s smiley faced Swoosh character has made its way onto the Nike Alumni Shorts in time to match the Nike “Have A Nike Day” Sneaker Pack that’s dropped ahead of Air Max Day. 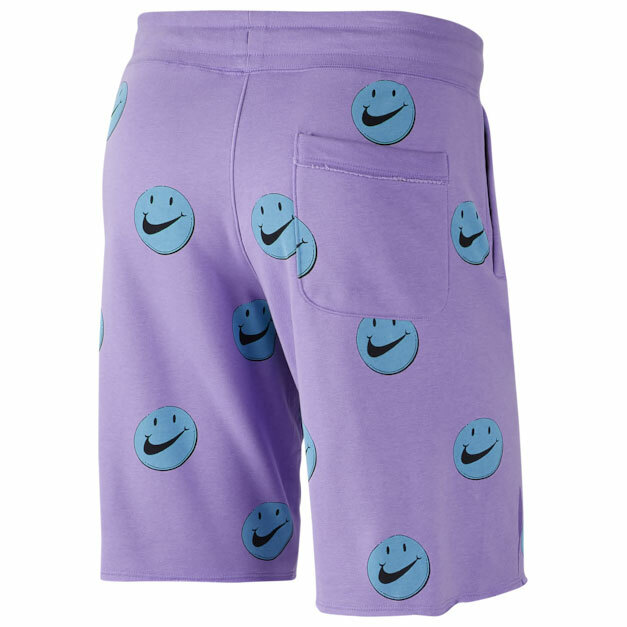 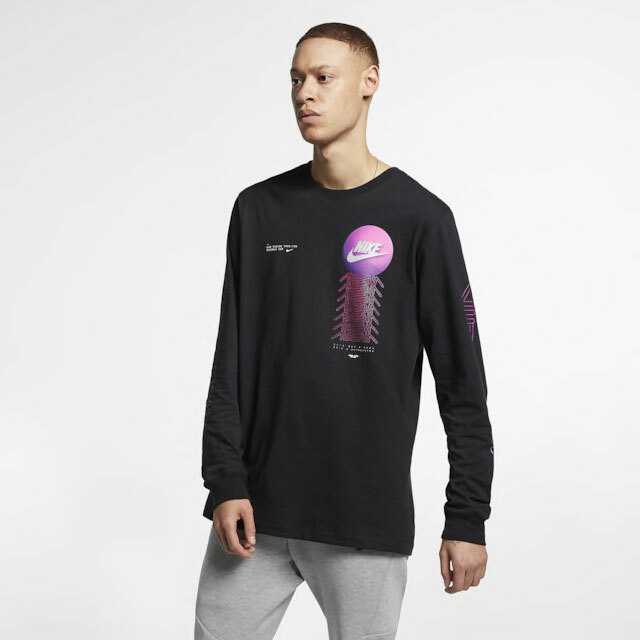 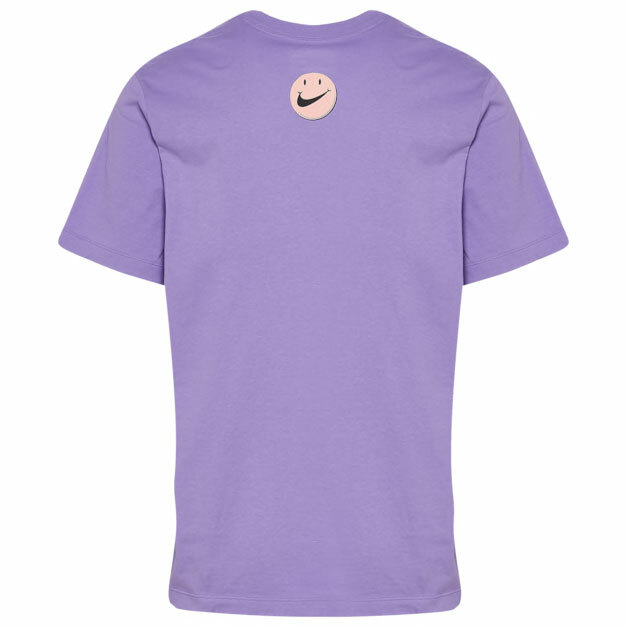 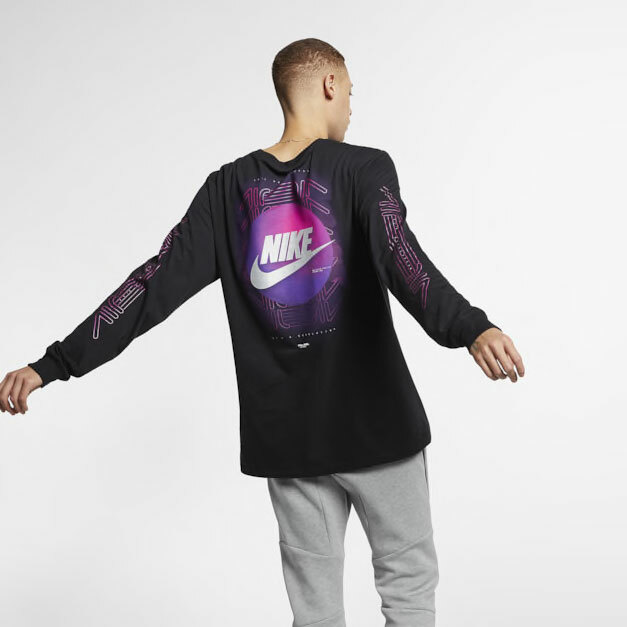 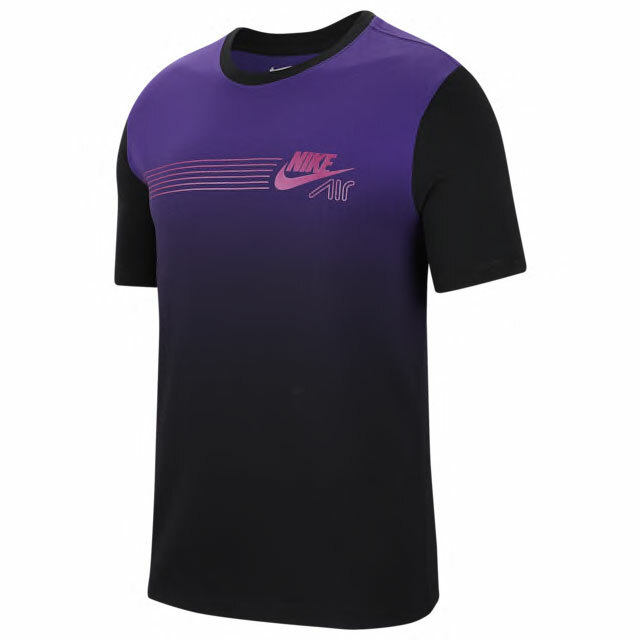 Featuring the same retro smiley face icon that’s popping up on several Nike Sportswear styles lately like these tees and jacket, the Alumni Shorts come in two different color schemes to complement the kicks, including black/purple and purple/blue just like the hues on the “Have A Nike Day” shoes. 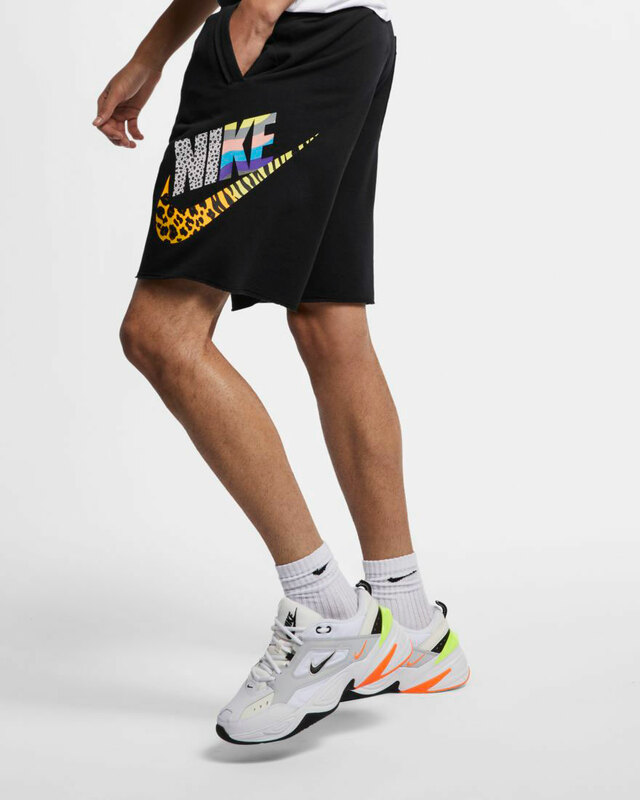 You can shop the shorts and sneakers below. 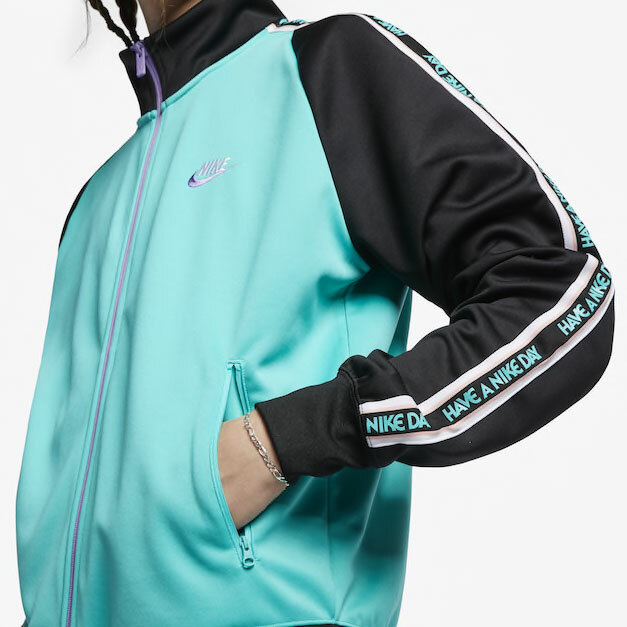 Spring colors and retro track style collide on the Nike Day Tribute Jacket to match the Nike Sportswear “Have A Nike Day” Sneaker Pack. 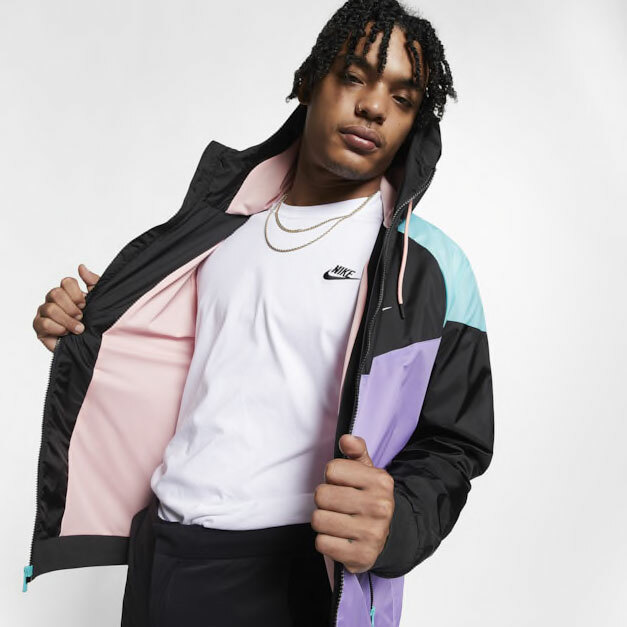 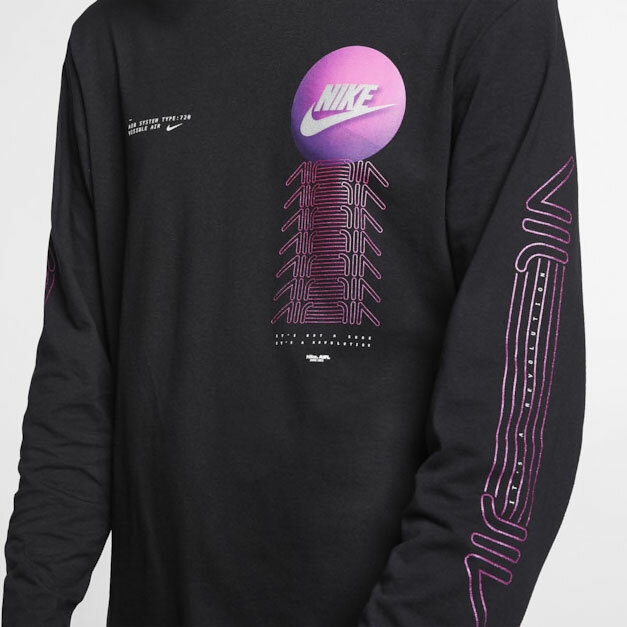 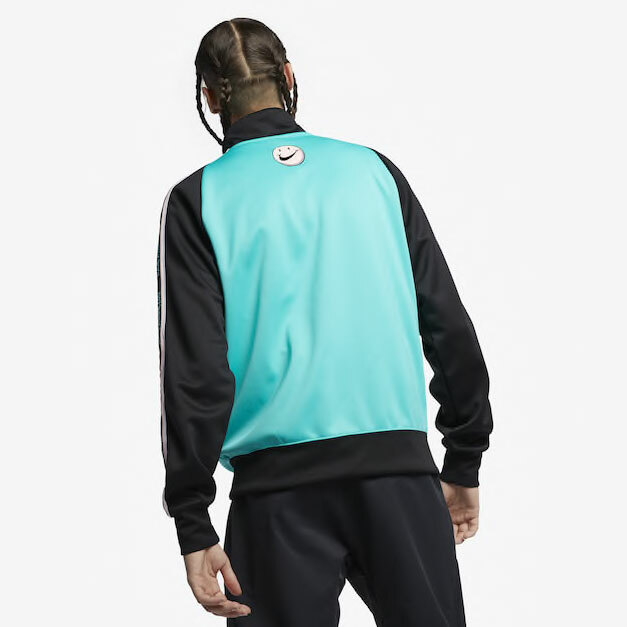 Featuring a black and jade color scheme with pops of pastel pink and purple to match the colors on the kicks, this new track jacket from the Swoosh’s Have A Nike Day Collection also includes the signature message on the sleeves with the smiley Swoosh character on the back to round out the retro look. 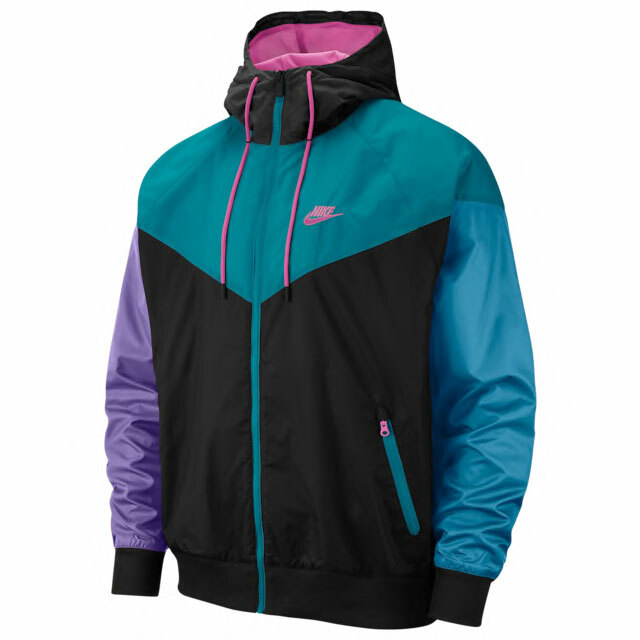 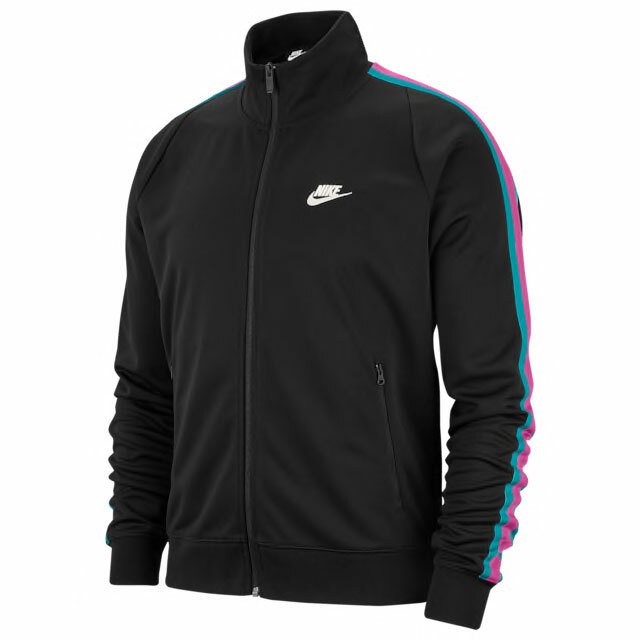 Check out the Nike Day Tribute Jacket and matching Nike shoes with links to shop it all below. 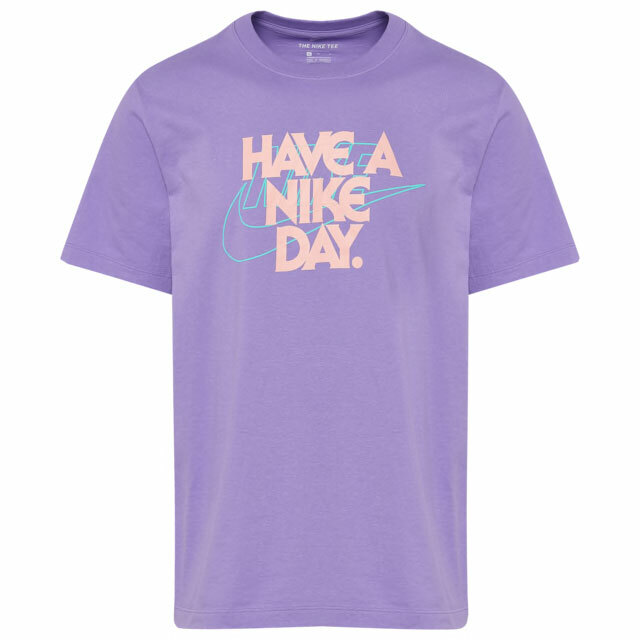 New from Nike Sportswear’s “Have A Nike Day” Collection that’s surfacing in time for Air Max Day which takes place on March 26th are these Have A Nike Day T-Shirts and sneakers to celebrate the Swoosh’s annual event. 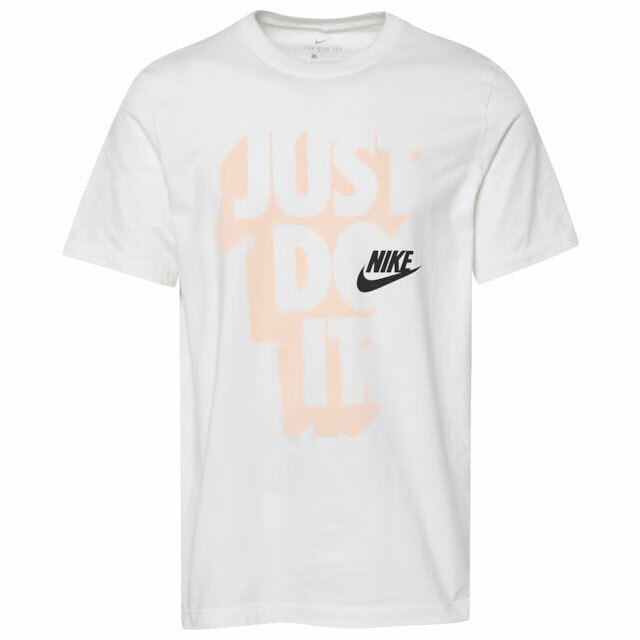 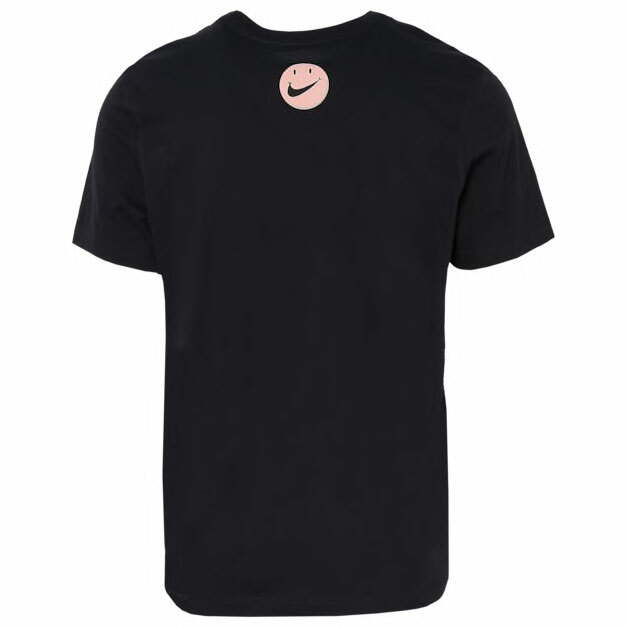 Featuring Nike’s smiley faced Swoosh character on both the tees and kicks, included are coral, white, black and blue Nike Sportswear T-Shirts that match up nicely with the colors on the “Have A Nike Day” Sneaker Pack which includes the Air Max 1, Air Max 95, Air Max 97, Air Max 270 and Air Force 1 silhouettes. 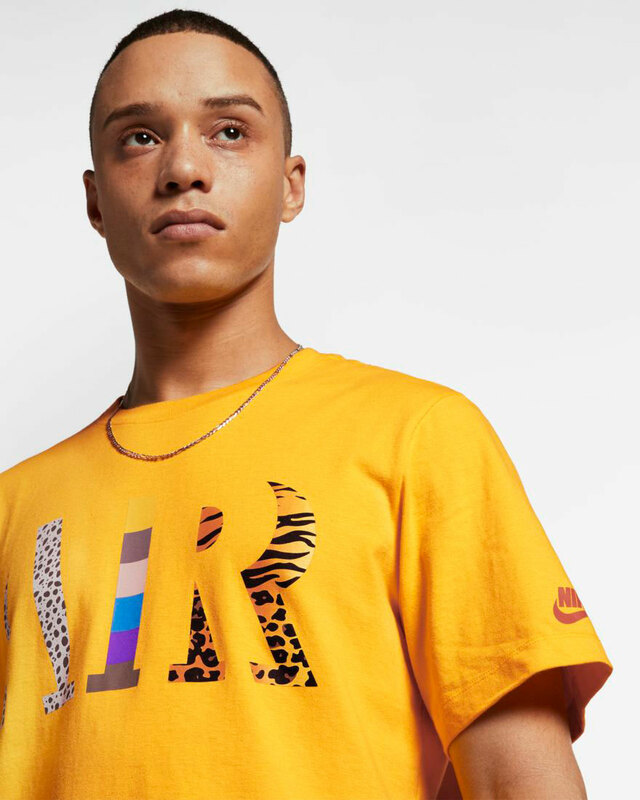 Scroll down for a closer look at the sneakers and tees with links to shop the collection below. 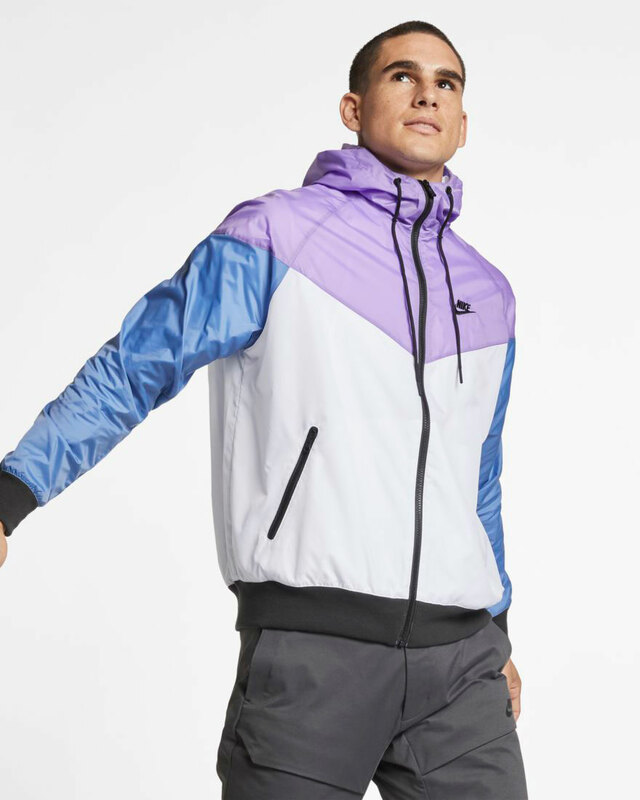 Hooking up with the Nike Sportswear “Have A Nike Day” Sneaker Pack are these new color schemes in the classic Nike Hooded Windrunner Jacket to zip-up with the kicks. 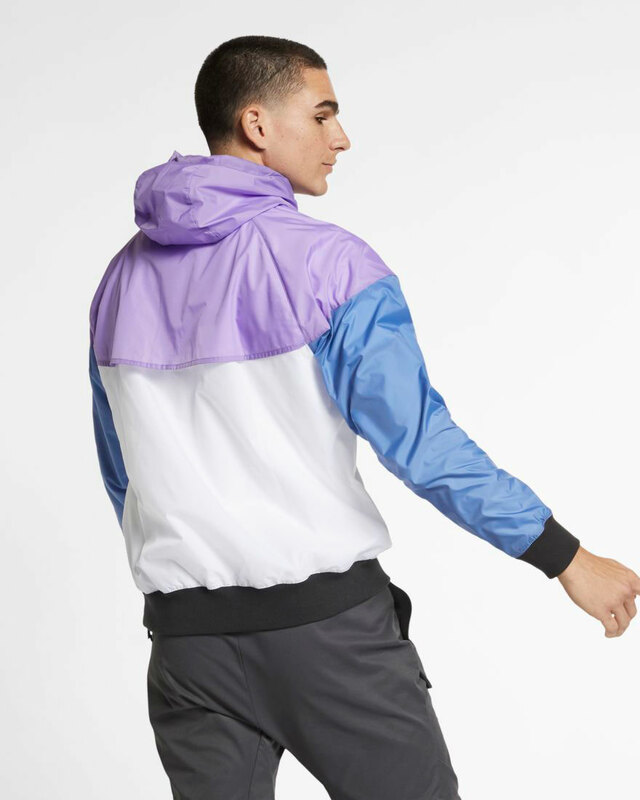 Giving you two different styles to choose from, both Windrunners mix pastel colors to match the kicks, making them perfect for spring and summer when it gets a little chilly outside. 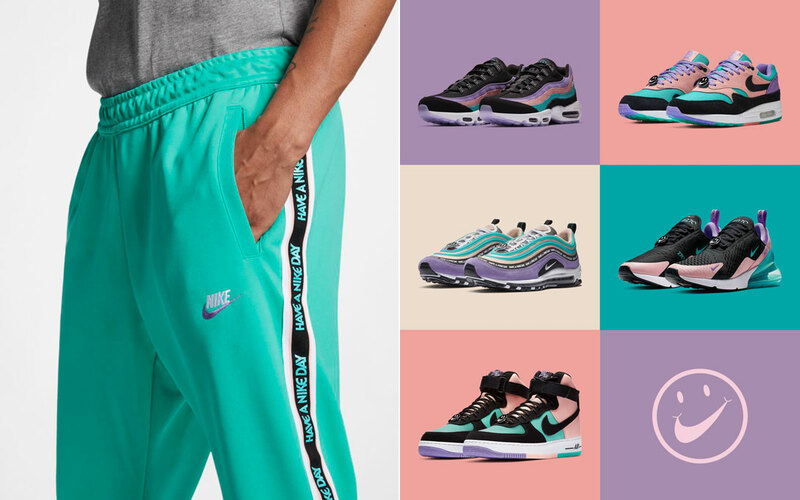 While one color scheme combines White, Space Purple, Indigo Storm and Black, the other option mixes Space Purple, Hyper Jade and Black to match the shoes just right. 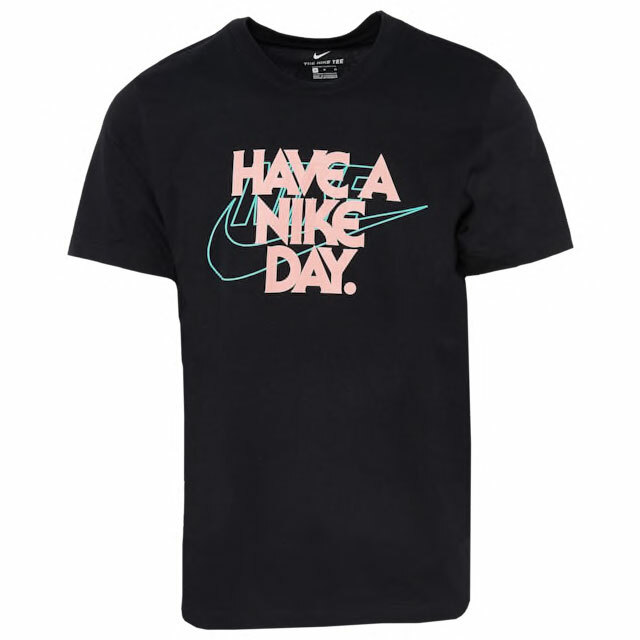 Check out both Nike Hooded Windrunner Jackets and the “Have A Nike Day” sneakers with links to shop it all below. 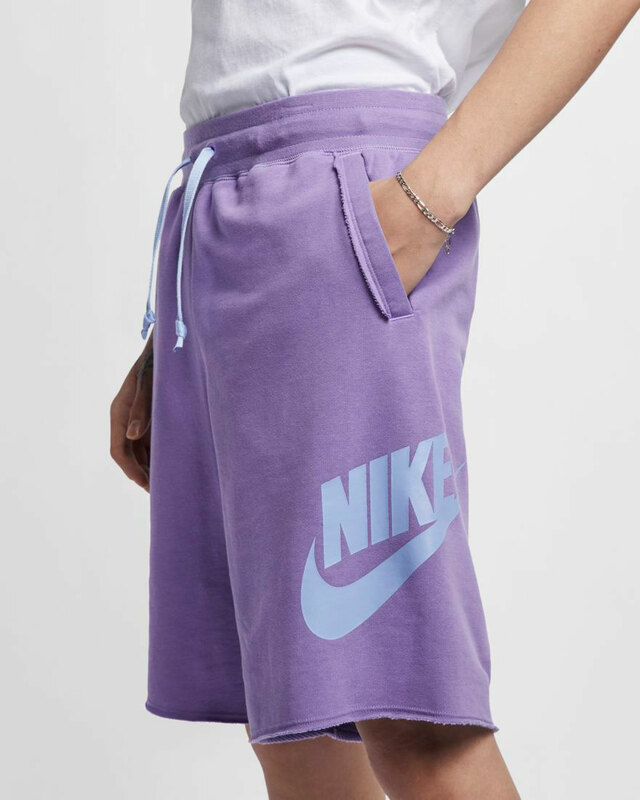 Gear up for spring and Air Max Day that’s on the way with these pastel colored Nike Sportswear Alumni Shorts to match the Swoosh’s “Have a Nike Day” sneaker pack. 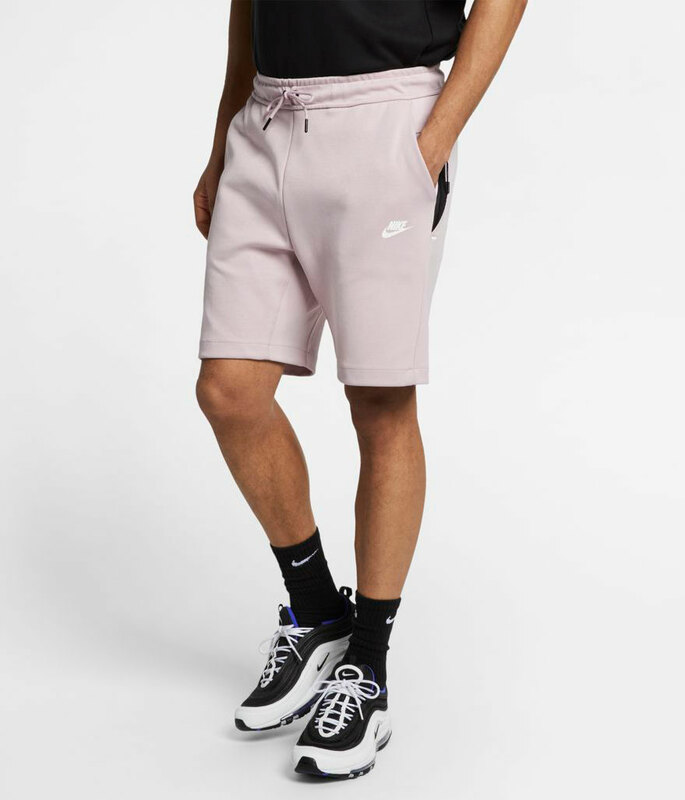 Perfect for pairing up with the Air Max 1, Air Max 95, Air Max 270, Air Force 1s and other new footwear styles that have surfaced for this year’s Air Max Day celebration, these new Alumni Shorts feature a classic athletic cut with raw edges for a vintage vibe and soft French terry fleece for comfort. 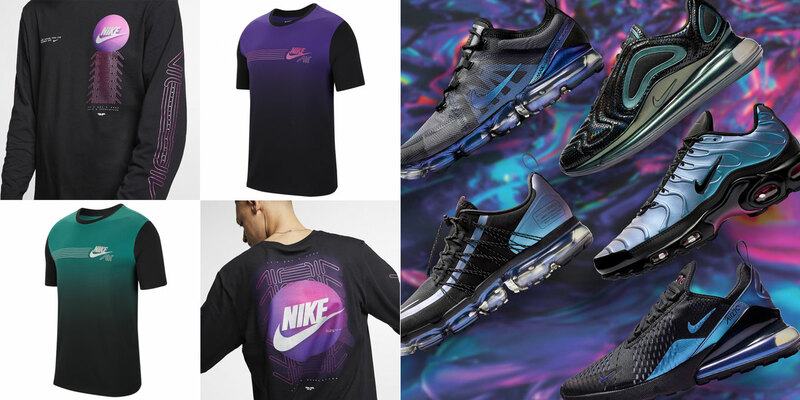 You can pick up a pair in Space Purple or Indigo Storm and finish your warm weather fit when lacing up the kicks during the spring and summer days. 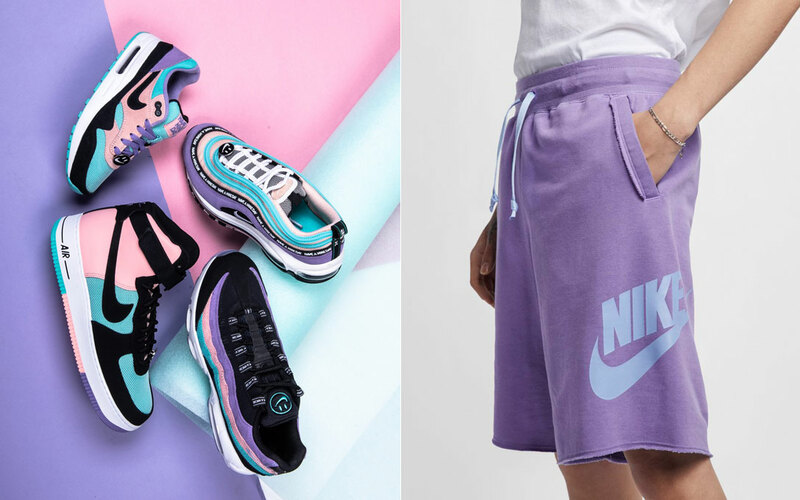 Shop the shorts and shoes below.